MPs who support remaining in the EU yesterday spent over eight unsuccessful hours in the first stage of their parliamentary attempts to derail Brexit. The Remainer MPs who spoke included the Labour Party, the LibDems, Nationalists, and a rump of remoaning Tories. The European Union (Withdrawal) Bill which they were debating is the essential piece of legislation which essentially copies all EU law into UK law, thereby ensuring a smooth legal transition at 11pm on 29th March 2019. Over 450 amendments have been proposed to the Bill and these will be debated between now and Christmas. We do not intend to report on these in any detail, or we would have no readers left by the festive season. Instead we thought we would bring you just one speech which brings out many points. The speech is by Sir William Cash MP, it lasts 23 minutes, and it includes interventions by Chris Bryant (Lab, Remain), Mike Gapes (Lab, Remain), Rt Hon John Redwood (Con, Leave), Wera Hobhouse (Lab, Remain), Antoinette Sandbach (Lab, Remain), Paul Scully (Con, Leave), Rt Hon Ken Clarke (Con, arch-Remain), Angus MacNeil (SNP, Remain), Robert Neill (Con, Remain), George Howarth (Lab, Remain), and Rt Hon Dominic Grieve (Con, arch-Remain). NOTE : Unfortunately it seems that ParliamentTV is currently having difficulties. If you can't click on the video below, that's why. Please check back later when we're sure they will have fixed it. You may feel you have better things to do with 20 minutes of your life than listen to the above, and we would have a lot of sympathy with that point of view, having had to listen to more than eight hours of the debate. However, it's there for you whenever you feel like it and it does remind the listener of some important things. For those readers who would like more, here is a list of a few speeches we have selected from the many yesterday. They each last about 10 minutes on average. Do we agree with everything Sir William Cash says? No. In fact we think he’s far too gentlemanly to believe just how bad things have now got across the Channel. We would go further than he does, based on our observations in recent years. However this speech is delivered by a man who knows the EU. Remainers may not agree with him, but they can’t deny his 32 years of experience on Parliament’s EU Scrutiny Committee. He is the Chairman of that Committee. His detractors accuse him of being long-winded about detail – but at least he does actually know the detail. We hope you watched the video – we think it provides a good flavour. If you want to watch the entire 8 ½ hours you can watch the whole thing here. Alternatively, here’s the Hansard transcript. It really doesn’t matter what these MPs say. They are Remoaners who do not respect the democratic vote of the British people on 23rd June 2016 to leave the European Union. Do they seriously believe that the country – with jobs, careers, families to look after – are in any way impressed by these self-indulgent ninnies playing legal niceties with Britain’s Brexit? They can prance and posture all they like in Parliament, spouting nonsense about parliamentary scrutiny. It may wash in Westminster and around the dinner tables of Hampstead and Oxfordshire. In the rest of the country it goes down like a lead balloon. These MPs can even pretend – as almost all of them do – that their intent is not to deny Brexit. No-one is fooled. It’s obvious that they are doing everything they can to thwart the democratic will of the British people. They should all be ashamed of themselves. Whilst we profoundly disagree with the Nationalists and the LibDems, at least their anti-Brexit stance was clear at the General Election held only five months ago. The Labour Party is another matter however. They blatantly stood on a platform supporting the Brexit vote, including leaving the Single Market and Customs Union. The only possible way to interpret the Labour Party’s current position is that the vast majority of their MPs have ignored the mandate they stood on and have reverted to full Remoaner status. This shows, in our opinion, complete contempt for their electorate. We very much hope they are punished severely at the next General Election. To his credit, over and again Frank Field MP (Lab) reminded his fellow MPs that “the larger the Labour majority in the general election and the bigger the turnout in the last general election, the one before that and the one before that, the more likely constituents were to vote leave.” Unfortunately Frank Field was one of the very few Labour voices to be heard backing Brexit. We believe he is wrong on many aspects of Brexit but at least he stands up for the majority of Labour supporters who are pro-Brexit. One final word about the Remoaning Rump of the Conservative Party. The parliamentary party in June 2016 voted by approximately 2:1 for Remain. In doing so they more or less presented a mirror image of the way ordinary Conservatives voted. Fortunately most Remain-supporting Tory MPs have now seen which way their bread is buttered and are behind the government’s moves to enact Brexit, albeit not in the way we believe they should. Below: What we refer to as 'the Conservative Coven' of Dominic Grieve, Anna Soubry and Nicky Morgan. To plot and side with anti-democratic forces in other British political parties and with those from the EU and from EU27 member states, against the best interests of the country. If Mrs May wishes to show a tougher side to her leadership, as many commentators suggest she should, in our opinion she could do a lot worse than sever this Remoaning Rump from the Whip of the Tory Party forthwith. They will never come around on Brexit and they will still naturally vote with the government on matters like the Budget, so nothing is lost. However a very firm message will be sent to any young MPs tempted to join them in the opposition lobby in the coming weeks. We welcome your comments, which we will publish below in the grey box below. You can use a pseudonym if you prefer, and it's always nice to know roughly where you're writing from. Please always state the headline of the article you're commenting on. Message: Apart from a few contributions it was a very poor debate. Yesterday the Foreign Secretary Boris Johnson attended the Foreign Affairs Council in Brussels, at which the main topic was the new PESCO agreement for combined EU defence forces – the so-called ‘EU Army’. Whilst Iran was also on the agenda – and Boris seemed to think this was the main item – the real highlight for everyone was defence. We can only assume that the Foreign Secretary has been very poorly advised by his officials. This would not be surprising. The FCO and MOD are manned by pro-EU, anti-Brexit civil servants whom we believe are not advising Ministers in ways conducive to the good of Brexit Britain. See articles below for more information. Message: A flying buttress is a big external pillar connected to the wall of a cathedral at the top. The cathedral in Utrecht was built with the very large central part completed first, before they built the buttresses. Half of it collapsed in a storm that hit the city soon after. It looks like we are going to be paying towards the unelected High representative's forces until 2021,if Mrs May gets her way. They will be doing everything they can to keep the buttress in place. The video above was released by the EU Commission yesterday as part of its propaganda over the signing of the new Permanent Structured Cooperation in Defence. Yesterday in Brussels the EU pushed through its common defence force agenda at a meeting of the Foreign Affairs Council, attended by Foreign Secretary Boris Johnson. 23 countries have so far signed up for what is known as PESCO or Permanent Structured Cooperation. The UK was not one of the signatories. (See our ‘Observations’ below.) The other four countries which have not yet signed are Denmark, Ireland, Malta, and Portugal. Of these, the Portuguese government is very keen to sign but it requires parliamentary approval first. The other 23 member states of the European Union all signed. Above is Austria's new young Chancellor yesterday, attending the meeting in his capacity as Minister for European Affairs as he hasn't yet taken up his new role. He held a separate bilateral meeting with the EU's Defence and Foreign Minister, Federica Mogherini. Here is the full list of participating countries who have signed the commitment for PESCO: Austria, Belgium, Bulgaria, Czech Republic, Croatia, Cyprus, Estonia, Finland, France, Germany, Greece, Hungary, Italy, Latvia, Lithuania, Luxembourg, the Netherlands, Poland, Romania, Slovenia, Slovakia, Spain and Sweden. Up until yesterday morning we had seen no official confirmation that the UK was not going to sign up to PESCO. Given that the UK government has signed up to – or failed to indicate its lack of consent to - every development of EU common defence forces since the EU Referendum, we had major concerns that the UK was going to sign up to PESCO too. It’s worth bearing in mind that in terms of parliamentary scrutiny, none of the agreements since the Referendum has been admitted to by the government and none of them has been debated in the UK Parliament. In fact the Prime Minister didn’t even mention that defence was discussed, in her last two reports to Parliament following EU Council Summits. Quite extraordinary. Fortunately it seems that the message has finally got through to the British government. We have been campaigning on this topic since before the Referendum – along with at least one other organisation - so it’s good to see that perhaps progress is being made. So, yesterday it was confirmed that the UK has not signed up to PESCO, although we have yet to see any statement of policy from No.10, the FCO, or the MOD. WHAT IS THE UK’S POLICY? The government has regrettably committed the UK to all defence developments discussed by the EU since the Referendum, including the new 'European Defence Fund'. We have reviewed all the formal ‘conclusions’ of the various Summits, Foreign Affairs Councils, and other official meetings and we can’t find one single reference to the UK having exercised a veto. Since 23rd June 2016, the UK government has agreed to everything the EU wanted to do in the field of defence. We feel that Theresa May - and the new Defence Secretary Rt Hon Gavin Williamson MP - should make a statement to the House regarding the UK government’s policy towards the defence manoeuvres of the EU. It is perfectly clear that the EU intends to replace NATO with its own common defence structure. It SIMPLY IS NOT GOOD ENOUGH to deny this. It doesn’t matter how much the EU protests that it doesn’t intend to replicate or replace NATO, that is exactly the course it has set itself on. Politicians, journalists, commentators, think-tankers, defence contractor organisations, or anyone else who tries to persuade you otherwise are simply wrong. We invite any MP who so wishes to inspect the evidence we have amassed. Yesterday the Poles were so concerned about this that their Foreign Minister insisted on a specific reassurance, before he committed to PESCO. Unfortunately EU reassurances are worthless. The EU always does what it wants, regardless of Treaties or its own laws. Again, there is ample evidence to support this assertion, from this year alone. We strongly believe that Europe’s defence will be seriously compromised – perhaps fatally so – if the political apparatchiks in Brussels are allowed to continue down this path. These people are not, in our opinion, competent to run a chip-shop, let alone to run the complex defensive apparatus for a European Union of 27 countries. Before you say: "Well, we'll soon be out of it, let them do what they want" we just have the following warnings. It would be profoundly dangerous to put enormous combined military forces in the hands of unelected individuals and bodies. The UK's defensive umbrella depends on having a strong NATO - something which will be increasingly undermined by the EU. The UK is already caught up in the EU's common defence plans. Message: This EU army project, just confirms what a totalitarian organization the UK is signed up to. When you pool your sovereignty with 27 other countries projects like this can be created with no accountability to any electorate, ie the ones who pay for these debacles. Has an EU army and Britain's participation been debated in our Parliament? No. What is interesting is that defence reviews by our Ministers have signed the UK up to long term bilateral military partnerships, with our EU partners which appear as a prelude to this EU army planning. 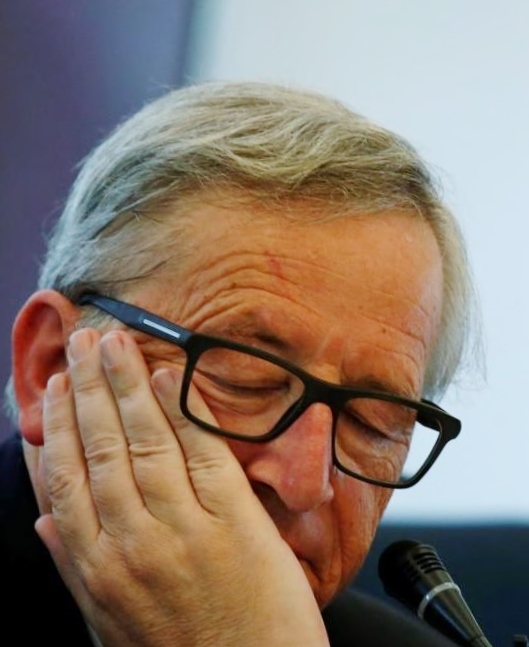 It was announced in the House of Commons, but I don't recall any mention of the UK being party of a EU army under the control of unelected Brussels Beaurocrat Mr Juncker. He in theory can send Britsh troops into conflict situations without any recourse to UK Parliament. I look forward to the day snowflake remainers receive their conscription papers for the EU army! It is being reported in the mainstream media that the new PESCO EU defence agreement has somehow come about thanks to the UK’s decision to leave the EU. This is not the case. The EU was already embarked on this course well before the Referendum. PESCO’s antecedents started back in the early 1990’s with Maastricht. That Treaty laid the foundations for a Common Foreign and Security Policy. In 1999 the European Security and Defence Policy (ESDP) was launched. By the end of the 90’s major decisions on combining defence were being made. By 2002 the 'Berlin Plus' arrangement was signed, allowing the use of NATO structures, mechanisms and assets to carry out ESDP missions. Two years later the European Defence Agency was created. By the beginning of 2007, the EU had two Battle Groups ready to deploy. In 2009 the EU’s military ambitions were truly evident when the Treaty of Lisbon came into force. The ESDP was beefed up and renamed the Common Security and Defence Policy (CSDP). It also provided for the creation of the European External Action Service, which is now running the EU military show. 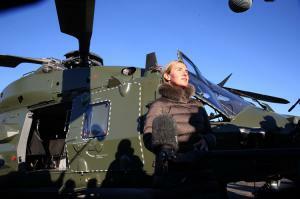 In June 2015 the High Representative (de facto EU Defence Minister and Italian former Communist Federica Mogherini) was mandated to prepare a new strategy by the European Council. The paper, under the title 'Shared vision, common action: a stronger Europe', describes a strategic vision for the EU's global role. A year in the making, the European Union Global Strategy (EUGS) was presented at the EU Council meeting on 28 June 2016, at which David Cameron was present. So, on 28 June 2016, just 4 days after the UK’s Referendum, High Representative Federica Mogherini presented the new EU Global Strategy on foreign and security policy to EU leaders, meeting in Brussels at the EU summit. PESCO is merely a part of this process. The EU’s military ambitions were perfectly clear years ago to anyone with half a brain. These ambitions are detailed in document after document. 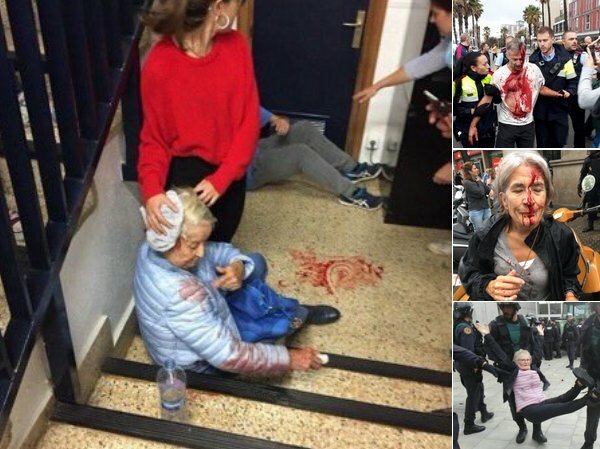 All of this was hidden in plain sight – the problem was the British media virtually never reporting what went on in Europe. Before we get howls of protest from journalists, we’re not talking about the British media’s obsession with stories about rifts in British political parties (in particular the Conservative Party over Maastricht in the 1990s). That does not constitute EU coverage as far as we’re concerned. In fact that didn’t even require a journalist to leave the confines of Westminster. No, we’re talking about what was going on in Brussels and the EU capitals. This simply didn’t register in the consciousness of the vast majority of British people because they never saw it on TV and almost never read about it in headline news stories in the newspapers. We ask all fair-minded journalists and commentators to step back for a moment and recognise that we’re not talking about news that only political wonks and foreign policy geeks will find interesting. We’re talking about news that registers on the front pages of the tabloids and on the TV evening news. The simple fact is that major developments were taking place – such as in the field of defence – and yet the British pubblic were unaware of them. It was this that allowed Nick Clegg to get away with his now infamous “this is a dangerous fantasy” put-down of Nigel Farage in the TV debate of 2014, when Mr Farage raised the subject of the EU’s military ambitions. Over and again during last year’s Referendum debate, we found we were having to provide basic information about what the EU was actually doing, as opposed to the naïve and idealistic hopes of what Remainers thought it was doing. This applied to the EU’s military ambitions. The latest developments are no surprise to us. They’ve been planned for a long time. We reported on them many times. The only thing that has surprised us is the the extent to which the British government seems to have acquiesced with the EU on defence matters ever since the Referendum, almost as though it were too cowardly to tell it no. If Theresa May and David Davis thought for one moment that letting the EU do what it wants on its various agendas will endear it to the UK and make it be nice to us over Brexit negotiations, forget it. The UK side has shown itself to be weak, weak, weak. The EU has simply taken advantage of this on many levels. There are early signs that the UK side might finally be starting to ‘man up’. If so it’s welcome, albeit long overdue. Message: Excellent articles today. I have to say I am at 'boiling point', though as always, we must keep calm and express opinions with 'cool heads'. It is clear from the FACTS when presented in the above format, we have been DECEIVED by UK peers and elected politicians [though not all of them] over the years? They constantly shout "scrutiny" yet attempt to subvert our common Brexit cause, and in all these years treat the British people as being of little or no consequence. We're nothing but the little people, to do as we're told and be quiet! I must balance my comment by acknowledging we have some very good MPs and peers who believe in our country, and in Brexit. They have struggled to get us where we are today, as indeed have Facts4eu. If my opinion is reflected across our great country on this subject, as it likely may be, It is perhaps time MPs explained themselves. We have the right to know WHY they failed to be transparent with the electorate? THEY ARE ELECTED, AND TO DECEIVE THE ELECTORATE ON ANYTHING MUST RANK AS AN ALL-TIME LOW. We like scrutiny in the UK so politicians and the public can challenge as and when. The EU commission don't do scrutiny and carry on regardless, often making up their own rules and grabbing powers where they can. I am still awaiting Michel Barnier [EU Brexit Chief negotiator] to publicly explain where he pulled his imaginary 100 billion exit bill from, right down to the last euro? We must remember, Barnier is not elected. He said it and MUST back it up with FACT or retract it? Have EU member countries yet realised they have signed up to what is becoming a very dangerous 'dictatorship' that appears to have 'dodgy' military ambitions? The national status and cultures of the EU27 will eventually disappear. Mrs May and her team MUST NOT sign away our country to any further EU related matters, as that means we exit the EU in name only, but remain bound by them, so we must also take back everything signed post-referendum. The UK is NOT FOR SALE, and is not for MPs and peers to give away - The UK belongs to the people. This morning the Defence Ministers of the EU28 (including Rt Hon Gavin Williamson MP, Theresa May's newest Cabinet Minister and an arch-Remainer) are gathering in Brussels. The EU's Defence Ministers are meeting to agree the final arrangements for PESCO – Permanent Structured Cooperation. This is an EU euphemism for pooling defence forces of as many EU countries as possible. Initial signs are that the UK will not sign, but no confirmation yet. Message: I am pleased the UK (and some other countries) have not signed up to 'PESCO', which I consider would have been a 'slap in the face' to UK armed forces, past and present. Without doubts, It would have been detrimental to our country and all we stand for, and fly in the face of regaining our sovereignty and total independence in 2019. In short, it would have been an insult of extreme and unforgivable magnitude? Call me a pessimist, but on this extremely important issue (at this time), I don't trust our Houses of Parliament one iota, unless they guarantee 100% they will not revisit the matter 'by the back door'? As the UK is presently the second highest contributor to the EU construct until our exit, I am concerned the EU Commission will quietly filter as much British taxpayers money as they can to fund the EU military obsession. For that reason alone, the UK should be 'screaming loudly' for FULLY audited EU accounts. Reply: Yes, at least that's something. Why the UK government couldn't decide this in advance is strange, but there we go. However the risks aren't over because of all the other new common defence structures and initiatives which the UK government has agreed to since the Referendum. We'll summarise this soon. Please note that the EU's moves today will have massive effects on NATO and therefore the UK - they just won't admit it yet. We have reported on this many times and will do so again. Naturally you could go to other pro-Brexit sites, where you could read the stories you'll find in the newspapers. But how many sites produce original Brexit work each day? How many spend hours and sometimes many days researching each important story - stories which you will not read elsewhere? How many produce great graphs which tell the story at a glance? Facts4EU.Org doesn't aim to list all Brexit news each day - other sites do that for you and they either link to other people's stories or they publish copies of the stories. Instead we aim to inform, provoke and sometimes entertain, with original and stimulating work we research and produce ourselves. This work is proven to influence opinion - across the country as well as amongst politicians in Westminster, Brussels, and the EU capitals. Bizarrely, the Establishment doesn't seem to want to fund us, even though we know that 'Establishment' figures read us. Unfortunately none of us are married to hedge-fund managers, like some publicity-hungry campaigners we could mention. And we choose not to be on the dinner-party circuit where donors to big-name think-tanks (which often do less than we do) might be found. Alas this all leaves us feeling good about ourselves, but also leaves us penniless. We badly need your help to keep going. Can you? If you rely on the BBC for your news, you may be concerned that you missed a report about Sir James Dyson’s views on the Brexit negotiations, as expressed to Andrew Marr yesterday. Don’t worry. You didn’t miss the BBC report on Britain’s most important industrialist and his advice about the most important thing happening in British political and economic life. You didn’t miss the BBC report because there wasn’t one. “The problem is the people we are negotiating with,” he said. To be fair to the BBC, we did find Sir James mentioned once. In a piece about Michael Gove’s interview with Andrew Marr yesterday Sir James was very briefly quoted and described thus: “Leave campaigner and entrepreneur James Dyson”. Stripped by the BBC of his knighthood and downgraded to ‘entrepreneur’, this little mention was buried in a political story about the Environment Secretary. It goes without saying that the epithet 'Leave campaigner' is a BBC euphemism for 'safely ignore'. SO WHAT HEADS THE BBC'S NEWS THIS MORNING? Nothing about the good Brexit news from Sir James Dyson. This is despite the fact it was even delivered on a BBC programme yesterday morning. Instead the BBC prefers to look ahead to news that hasn't even happened yet. If you look at the screenshot above, you can see that the BBC gives you a 'news' item that isn't in fact news because it hasn't taken place yet. It gets prominence because it relates to organisations which are known to be heavily pro-EU and anti-Brexit. And you'll note that every item is negative about Brexit. Note that it also takes the usual BBC stance that 'EU right, UK wrong'. There is never any suggestion that in fact if 'business leaders' such as the anti-Brexit CBI and IoD have concerns, perhaps they should address these to the EU, not to the UK government. After all, it's the EU which has been totally intransigent in the talks so far. It's the EU which has imposed ridiculous constraints on what can be discussed, and has said 'this isn't a negotiation'. And it's the EU which has just issued an aggressive ultimatum, despite having made no concessions itself. If the BBC were in any way, shape, or form an impartial observer in these things, its coverage would be completely different. Sir James is a man who is worth listening to on many subjects. When it comes to business and international trade, he's a 'go-to' man. He doesn't waffle about it, like so many Remoaner politicians who lecture us in grand tones, based on precisely no business experience. Sir James talks in simple language based on decades of experience and makes elegant points. Regular readers know that some of the Facts4EU.Org team have international business experience. It is such a pleasure to be able to write for once about a man who knows what he's talking about. Sir James made one very important point which the mainstream media didn’t seem to pick up on yesterday. Dyson (the company) pays WTO tariffs already. It pays them because it manufactures products in countries outside the EU and pays tariffs when it imports those products into the EU. This is a point that Sir James has made many times before. Regrettably neither business nor Brexit journalists seem to want to pay much attention to this important point. Dyson already trades under WTO rules. And it's one of the most successful companies in the EU. The ignorant politicians and commentators whom we are forced to listen to on a daily basis tell us about the ‘cliff-edge’ and the disaster that would be exiting the EU on WTO terms. The reality is that the largest economies in the world trade with the EU without having Single Market and Customs Union membership and they trade perfectly successfully with tariffs. Dyson is a good example. In its latest annual financial results sales rose 45% and profits increased by 41%. Not bad for a company that is already at the bottom of the cliff which the Bank of England, the BBC, and others constantly warn us about. Message: Sir James's points that they already trade with the EU under WTO rules yet they are such a success they paid £450m in taxes are very powerful and cannot be emphasized enough. I agree with him that we should just walk away from the EU "negotiators" and spend our resources and energies focused on the world market rather than the diminishing EU. Message: The BBC are an irrelevance. And once we are out of the EU they are going to have to eat humble pie and change their rhetoric. I look forward to it. Anyone with a modicum of common sense can see what the BBC are up to, trying to rubbish our Brexit and scare the viewers. But we are leaving in spite of them. All the last-ditch efforts by certain individuals coming up with comical tales of how we could stay in the EU are ludicrous. It isn't going their way. And have you heard the Barnier 'latest'? Threatening to ban British pets from travelling to EU countries unless we come up with bundles of cash? That is one hell of a desperado! We are leaving. And I was so pleased to listen to Mr. Dyson's interview. Lovely to hear of his success as a business man, entrepreneur, inventor and now setting up an engineering university. His wisdom is well worth listening to. Here is an extremely successful, honest man who easily flips Remoaners over with his powerfully strong truths. Tomorrow, Tuesday 13th November, the EU will take another massive step towards its ultimate goal of pulling all these forces together under the EU umbrella. EU Defence Ministers including newly-appointed Gavin Williamson from the UK, are meeting to agree the final arrangements for PESCO – Permanent Structured Cooperation. This is an EU euphemism for pooling defence forces of as many EU countries as possible. 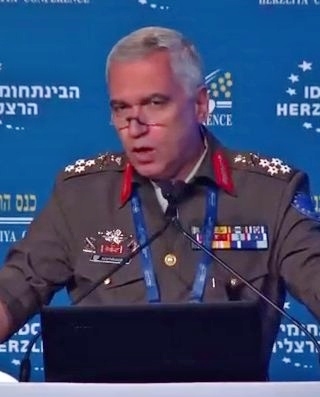 The quotation above comes from a speech made by the Chairman of the European Union Military Committee, Greek General Mikhail Kostarakos, only a few months ago. We tracked him down (digitally) to a campus near Tel Aviv where he gave a speech during a conference attended by many significant international figures, including a certain Mr Tony Blair, who also gave a speech. The European Union Military Committee (EUMC) was set up by Council Decision 2001/79/CFSP. It directs all military activities within the EU framework, in particular the planning and execution of military missions and operations under the Common Security and Defence Policy (CSDP) and the development of military capabilities. IMPORTANT: None of what we are telling you is ‘fantasy’, as described by Mr Nick Clegg many times prior to the EU Referendum and prior to the last EU Parliament elections. Putting it simply, Mr Clegg lied then and has lied repeatedly since about the EU’s military aims. We have full documentation and sources for everything we report to you and it all comes from official sources. SO WHAT EXACTLY IS PESCO AND WHY DOES IT MATTER? So, the EU is tired of the slow progress in getting its own army. PESCO is the way to accelerate the process. Once a member state has agreed to participate, that’s it. They’re on the wild ride to full integration of defence forces. WHICH COUNTRIES ARE SIGNING UP? We know that over three-quarters of all EU members states – at least 22 countries – are planning to commit tomorrow. We know that Malta and Denmark plan to opt out. We know that Portugal still has to get parliamentary approval but wants to sign. It is very difficult to be certain of the final list but we will know more after the meeting in Brussels tomorrow. WHO IS DRIVING THE NEW EU ARMY? The EU has a de facto Defence Secretary named Federica Mogherini. Her formal title is ‘High Representative of the European Union for Foreign Affairs and Security Policy and Vice-President of the European Commission’. Now you know why we refer to her as EU Foreign and Defence Secretary. Ever since the Referendum, the UK government has quietly signed up to every new EU defence initiative which has been put forward. This has happened across several EU meetings attended by either Theresa May, Sir Michael Fallon (former Def Sec) and Boris Johnson (Foreign Sec). We also know that this has happened in relative secrecy, with the British press apparently being uninterested and no coverage on BBC TV. Facts4EU.Org has reported on these developments regularly and we have also shown how Theresa May’s statements to Parliament following EU Summits at which these important defence decisions were taken have very regrettably failed to mention anything about them. Once again we make our offer to the defence and foreign affairs correspondents of all major British media outlets. Contact us and we will provide you with all the details. WHO IS DRIVING THE UK’S POSITION TOMORROW? The UK’s new Defence Secretary is arch-Remainer Gavin Williamson. Williamson is a man who doesn't even believe in the Military Covenant. He voted against it on all three occasions in the Commons. However he was PPS to David Cameron up to and during the Referendum campaign and crucially he ran Theresa May's campaign for the leadership when Cameron quit. It seems that these last two elements of his CV were enough to get him the top defence job. We have been unable to locate any evidence of interest whatsoever in matters military in Mr Williamson's background or career to date. Tomorrow’s meeting will deal with practical matters relating to PESCO. Anything agreed tomorrow will then have to be formally ratified by the members of the EU Council at the next summit in December. Nevertheless any country committing tomorrow means there will be a formal commitment in December. Incidentally, this is the same summit at which Mrs May hopes the EU27 will give the go-ahead to open up the Brexit talks to full talks – as they always should have been. This does not mean that Mrs May can simply acquiesce to all the essential non-Brexit matters such as PESCO which will also be discussed. The UK remains a full member of the EU until 11pm on 29th March 2019. 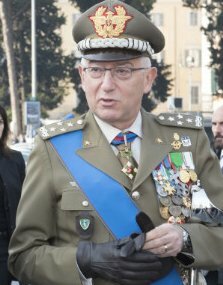 Next year, EU Defence Secretary Federica Mogherini even gets her very own General, when Italian General Claudio Graziano will take over as Chairman of the European Union Military Committee. You might also wish to know that for years Ms Mogherini was active in the Italian Communist Party, only leaving when it disbanded. Now she runs Foreign and Defence policy for the whole of the European Union. It’s a funny old world. Incidentally we also believe that she will run for EU Commission President when Jean-Claude Juncker resigns and we think she’ll win. (You read it here first.) We consider her to be a very dangerous woman indeed. We cannot emphasise strongly enough how the EU is ploughing ahead fast with all its moves to create ‘hard power’ for the EU. We are not making this up. Very soon she will have in place the means to transport EU army units rapidly across the EU in the event of a ‘security need’. Imaging how the people of Catalonia might feel about that? Or perhaps one of the member states which doesn’t agree with the EU’s enforced migrant programmes? Where will this lead? WHAT WILL THE BRITISH GOVERNMENT DO TOMORROW? If, tomorrow, there is not an unequivocal statement from the British government that the UK will not be participating in PESCO, we ask all right-minded MPs to call for an emergency debate in the Commons. If you share our concerns about the future independence of the United Kingdom’s armed forces after Brexit, please contact your MP and tell him or her. Even if the UK formally opts out of PESCO tomorrow, the UK government has already committed the country to a whole raft of new common defence policies, structures, and even the new EU Defence Fund. All of this has happened quietly since the Referendum. We believe it’s very important that when we leave the EU, we don’t leave our armed forces behind. Message: Hi Guys Seems to me that you and your Brexiteers are missing the point. The "Deal" that's going down is the give-away of our Military to control by a Foreign Power - the EU Dictatorship. It's being done behind closed doors by May, Fallon and rabidly pro-EU Dictatorship Civil Servants, and the "Brexit Negotiations" are a smoke screen to cover it. The NationState that gives it's Military over to control by a Foreign Power ceases to be. (Actually, under the Lisbon Treaty, the UK ceased to be on 1 January 2009. Are you aware of that..?! !...they just "forgot" to tell us Brits..!!). Another thing - we are in a state of Lawful Rebellion under Magna Carta Article 61, and have been since 23 March,2001. Have you sworn your allegiance to the Barons.... or do you stand in outlawry against our Constitution,as do our Party Representatives in Westminster? I would like to think that you know nothing of this, but will do the right thing and investigate the truth of what I've told you. Our Country is in a parlous situation and the traitors who have caused it need to be brought to book so that we can, after almost 5 decades of destruction of our Nation State by bought-and-paid-for Quislings, rise again and be a Country we can proudly hand over to kids and grandkids. They do not deserve to subjugated under the Jackboot of the European Project for the benefit of the Globalist Corporations/Banksters and NWO zionists. Lift the veil, Jonathan...tell the People what's REALLY going down and let's get our Country back properly!! We don't want the fake "Brexit" that the MSM and our puppet politicians are hell bent on giving us, because it will come to a stage where the People (those who are not yet awake to the reality of the situation), will take to the streets. This must be avoided because it's the excuse our so-called leaders need to declare Martial Law. THAT will mean foreign boots on our soil - the EU Military... not a pleasant thought - as I'm sure you'll agree...!! Best Regards, Simon Robertson Standing in Lawful Rebellion under Magna Carta Article 61. Message: The following are the points I will be sending to my local MP, Mr James Cleverly (Conservative) Braintree: If the UK Tory Government is truly adhering to the majority (EU Referendum) Leave result then: 1) There must be a STOP to any further agreements with the EU on its new EU Defence Army plans. Any cooperation by Britain in this dangerous liaison, whereby we hand over our military capability and on-going funds, ties us in to the EU indefinitely, and reduces our own Defence further, already suffering huge cut-backs also places us in a highly weakened position in the EU Brexit talks. Never hand over Defence of the Realm capabilities to an aggressive, non-elected, EU Elite. The UK's new Defence Secretary, arch-Remainer, Gavin Williamson therefore must be prevented from attending any meetings on this matter, starting again this week, being a Remainer at heart, is extremely 'green' being a very new appointee with no Defence experience, and who climbed his way up in Cameron's failed Remain administration. Neither must anyone else attend. A last minute cancellation would send a very strong message that Britain is not for messing with. For Germany in particular to push for such an Army is warning enough. Control of any dissent, within the EU, is clearly one aim. Hungary, Poland, Catalonia and even Britain could well be invaded by such a Force, even though we'd have contributed to it. Control lies with an unelected EU appointed 'puppet'. So called control of external borders is unbelievable as a reason, the EU Parliament having themselves invited millions to swarm over into the EU uncontrolled, including limitless numbers of terrorists who have been targeting, murdering and maiming innocent European men, women and children in countless bloody attacks. We are leaving the EU and are duty bound, not only for our own self-determination, but to protect the independence expressed by others across Europe not to take part in this maniacal plan. I am appealing to you and all MPs to ensure no further discussions, or agreements, take place between Britain and the EU on the EU Defence Force. Message: This is an issue I have long felt may quietly come about. Ever since I saw Clegg debating with Nigel Farage (thank you for putting up the video) I KNEW Clegg was LYING. You could see from his body language and his sarcastic manner thinking he knew better. People like me were NEVER convinced by Clegg, and I feel it's fair he now gets down on bended knees and makes a PUBLIC APOLOGY to Nigel Farage, whom indeed, yet again, has been PROVEN correct. If Mrs May (UK PM) signs up the UK to PESCO, she and anyone else involved would be TRAITORS to our country. How I wish Tony Blair had not diluted the Treason Act? I see this as a 'back-door' to keeping our country in the EU, and a continuation of £billions leaving our shores - WE DID NOT VOTE FOR THAT, WE VOTED OUT TO TAKE BACK CONTROL. This is EU styled democracy where they don't inform people of their true intent? It's reasonable to assume many within Government circles and Whitehall are maintaining this secrecy, including the 'top brass' of our armed forces and security services? I cannot imagine for a moment the Loyal Opposition (such as it is) know nothing of this, but SILENT they most certainly are. The new UK Secretary of State for Defence, the Rt Hon Gavin Williamson MP, is 'up to his neck' in spin. Remember he was the former Tory Chief Whip? 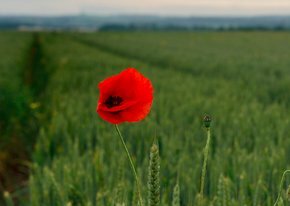 Today is Remembrance Sunday when we remember those who fought and died for the freedoms we enjoy today. Our service personnel should be VERY ALARMED by a man who does not believe in the Military Covenant and voted against it, and we the people MUST support our service personnel. Williamson is a disgrace to our country if he goes ahead with this. In my view, Mrs May promoted a pen-pusher to Defence Secretary to oversee what's now happening - like a clerk does? We NEED to stop this, otherwise Mrs May will continue quietly giving away our country bit by bit (like previous PM's). The EU Commission act VERY QUICKLY when they want to do something at OUR EXPENSE, yet they fail to properly discuss Brexit at the same pace, other than to threaten us. THEY MUST BE STOPPED, AND WE SHOULD EXIT IMMEDIATELY. All relevant parties in the EU deny vehemently that the new EU combined forces are designed to replace NATO, but you would have to be very naive or very stupid to believe this. what makes you think you can pay for EU defence forces? 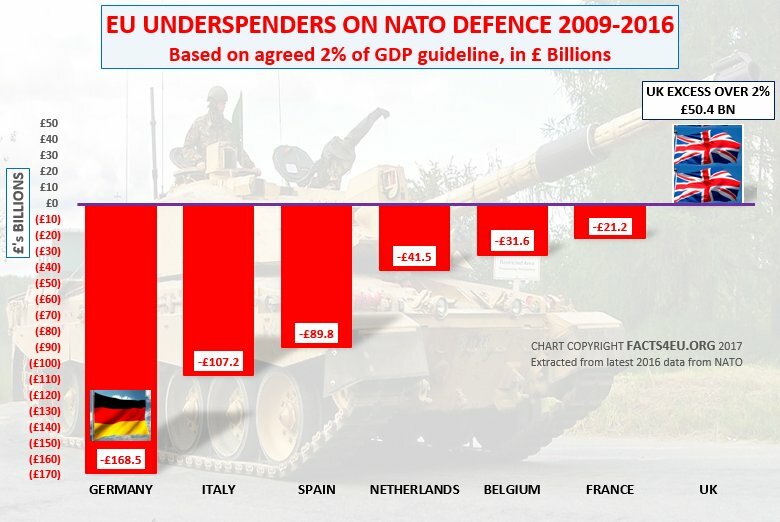 Our chart below shows the sorry story of the inability of EU countries who are also members of NATO to pay for their fair share - being 2% of their GDP each year. The idea that the dysfunctional European Union is in any way competent to direct its own military forces in protection of the exterior borders is, frankly, far-fetched. NATO is the tried and trusted defence organisation which has kept the peace in Europe. We strongly recommend that the EU countries concentrate on paying the minimum 2% of GDP as their defence budget, before thinking about any EU initiatives. We also believe the EU should focus on solving all its various crises before trying to take on responsibilities for which it is ill-suited and totally unfunded. Message: Your observations are commendable and to the point. However, although I also believe the EU "should" focus on solving all its various "crises" and should adhere to its current responsibilities, the calamitous EU will arrogantly pursue this project with vigour, regardless of public opinion. It is clear we have already reached the tipping point and the EU will have its way regardless! My greatest fear is the UK Government will not heed your advice/warning, which is to withdraw the UK from PESCO discussions outright and will, in some shape or form, sign us up to something potentially incalculable? 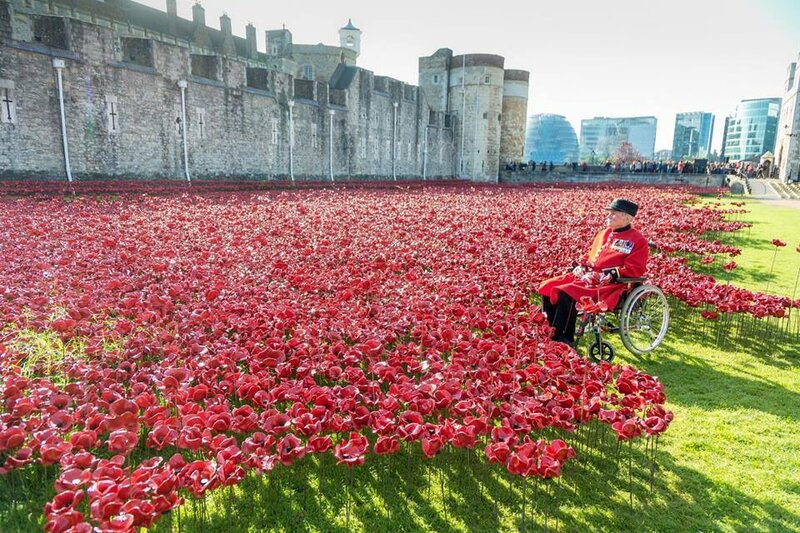 Click the image to buy a poppy or other items, including pins, jewellery, clothing, accessories, and other possibilities, from the British Legion online shop. 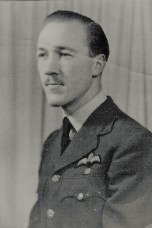 From flying Spitfires, Hurricanes and Mustangs against the Germans in WWII, to flying fighter jets in the Cold War against the Soviet Union, this man knew what being British meant. He believed in preventing further wars, so he was happy to be part of the defensive NATO umbrella which has kept the peace in Europe for decades. He believed peace was helped by peoples trading freely with each other, and welcomed the Common Market. He was appalled by what the EU became and backed Brexit. He was our Editor's father. He would not want you to remember him, but he would want you to remember all his comrades who fell from the skies in defence of freedom. We remember him today. RIP. 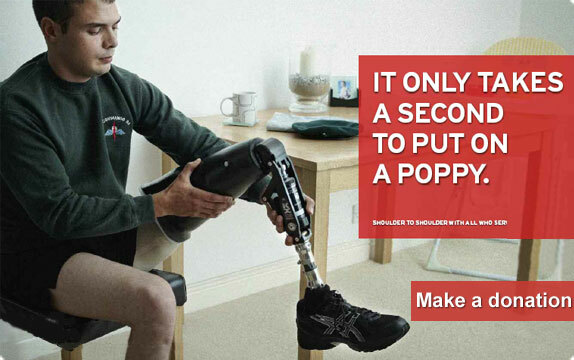 Click here to buy a poppy or other items to support the British Legion poppy appeal. Message: They were the Salt of the Earth. If you visit any Commonwealth War Graves Commission Cemetery you see quite clearly how much this Country and her Commonwealth have given to save Europeans from themselves. Visiting Souda Bay on Crete, I was struck by stone after stone with the inscription 'A Soldier of the Second World War: Known unto God' - the 'Known unto God, 'Known unto God' repeated stone after stone, row after row. Places such as Souda Bay, which have a stark beauty because of Sir Edwin Lutyens and Gertrude Jekyll's original templates, are probably the saddest places on Earth. This morning's Daily Mail carries a major investigation into a very biased story from the BBC about Brexit's impact on the NHS. It's a good piece, exposing the nonsense from the BBC. “Radio Four’s flagship news programme, Today, nine days ago led with the news that there has been a ‘drop of nearly 90 per cent’ in EU nurses registering to work in Britain over the past year. The only thing is.... Facts4EU.Org debunked almost the same story five months ago. Below is the exclusive story we ran in June. Below that, in our 'Observations', we make some new points which you may find of interest. To produce this headline, the Health Foundation took some highly selective information from the official body, the Nursing and Midwifery Council (NMC). Facts4EU.Org has analysed the same original data from the NMC, as well as researching more thoroughly using information from the NHS itself and the respected industry magazine the Nursing Times. The base month of July was in fact after the Referendum, not before it, and was the peak month last year. July was the deadline for applications from the EU to be completed, before nurses had to pass a language fluency test. This language test has been questioned by NHS Trusts and others because of its dramatic effect on applications from the EU. Note: This language test is unconnected with Brexit – it was introduced 6 months earlier. HOW IMPORTANT ARE EU NURSES TO THE NHS? Overall, EU nurses represent a small proportion of the total nurses and midwives in the UK. Currently they are 5.4% of the total, up from 1.8% in 2010. 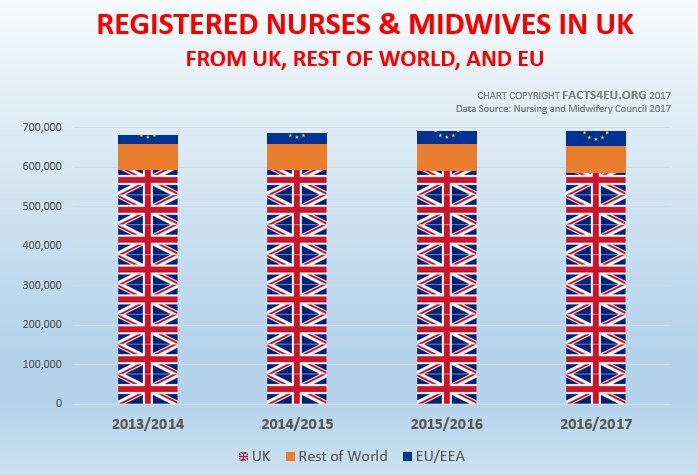 It is only in recent years that the number of EU nurses working in the UK has grown, but they are still a small proportion of the overall numbers. Until January last year, new applications from EU nurses were welcomed without the need for a language test, making them an attractive proposition for any recruiter. When the new rules came in, the Nursing and Midwifery Council (NMC) set the standard for nurses at 7.0 on the IELTS language scale. This is a very high degree of written and oral fluency and the evidence from the industry shows that applicants from EU countries have struggled to meet the standard. In April this year the Nursing Times even ran an article about the problems of recruiting EU nurses, due to the new language test. They quoted several NHS Trusts as well as specialist nursing recruitment companies, all complaining about the test’s effect on numbers. WHAT HAPPENED TO APPLICATIONS, AND WHEN? Although the new language standard applied from January last year for new applicants, existing applicants could still complete their applications without a language test. They were given until July 2016 to do so, and unsurprisingly this became the peak month last year. So, July 2016 was the first month after Brexit, and yet newly-completed EU nurse registrations jumped 32% compared to June 2016. The peak month of July 2016 also happens to be the baseline month chosen by the Health Foundation for its ‘before and after Brexit’ report, on which it produced its “96% drop in EU nurse applications” report. In other words, the Health Foundation used the peak month for 2016 which appears to have been caused by the new language test deadline. They then compared it to April this year, which was the lowest month for 2017. The Health Foundation is a charity based in London. They are “funded by an endowment - currently around £800 million”. There is no doubt that they are active in many ways to improve health and healthcare in the UK. It is, however, a great shame that they have chosen to promote a high-profile anti-Brexit story which is so full of holes, as this immediately casts doubt on their other research projects. It would be surprising if Brexit wasn't having an effect on the number of EU nurses considering an application to the UK. Apart from anything else, the position of EU nationals in the UK after we exit the EU is uncertain, thanks to the EU refusing to discuss this when Mrs May asked them to agree a deal last year. That said, the position on EU nurses is very different to what you will have seen on TV and read in the media in the last 48 hours, as we have shown. 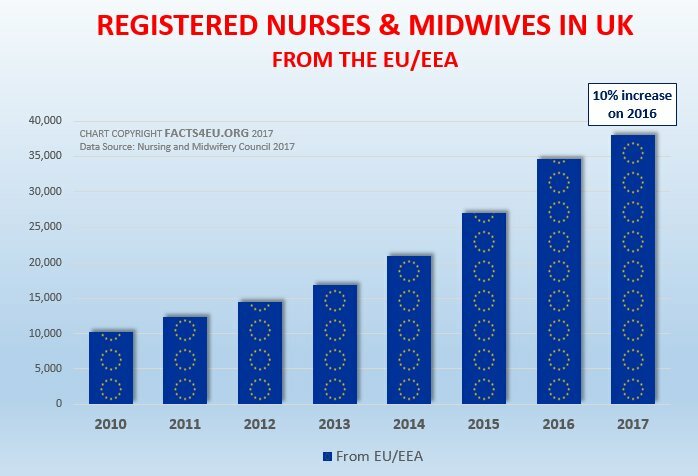 EU nurses represent a very small proportion of the total number in the NHS, and their numbers are in fact 10% higher in the year to May 2017 than in the same period last year. We chose to go into detail on this erroneous story as an example of the anti-Brexit bias of the establishment and the TV media in particular. Frankly it’s a wonder that anyone out there still believes Brexit is a good thing. Thank goodness for the good sense of so many of the British people. Okay, we researched and wrote that back in June when the first stories appeared that Brexit was causing a mass exodus of medical staff. Here we are in November and the same stories are still apparently being recycled by the medical profession and the BBC. The administration and direction of the medical profession (not necessarily actual practitioners such as doctors and nurses) are mostly pro-Remain, along with the establishment of most professions in the country. Sadly, the medical profession continues to blame Brexit wherever it can, for the massive increases in the cost of delivering ever more sophisticated healthcare. This was a cynical political move by a paid civil servant and in our view he should be fired for it. We've had enough of these superior-sounding and overpaid apparatchiks who can't stand the fact they got it wrong over Brexit and are trying to find any way they can to justify themselves. Day after day we hear these people doing down their country and their own area of its activities. Frankly, if we were EU nationals working for the NHS, we'd listen to Stevens and if we weren't thinking of leaving we'd be thinking we should be. However when Brexit is finally delivered and if the tremendous political engagement by ordinary people up and down the country continues, why shouldn't we make it clear in future that senior positions can only be filled by positive people who believe in their country? And as for organisations like the BBC, they will need to start adapting fast. It's clear to us as we listen to, read, or watch their output, that they still just don't get it. Their Smugnesses at Broadcasting House who pump out 'The Today Programme' on Radio 4 each morning don't seem to realise what dinosaurs they have become. We'll leave you with an illustration. Our Editor was talking to a very senior politician last week, who mentioned the Today programme. He was complaining that although he had appeared on it, some people were saying he wasn't making enough of a case for Brexit. He said that it seemed people just weren't listening to it any more. Our Editor suggested that if by 'people' the politician meant ordinary people rather than those in the Westminster bubble, these ordinary people have spent the last few years finding much better news outlets than the BBC. Message: I managed to watch as much as I could of Sir Simon Stevens spreading his message. Notwithstanding his 'sickening' taxpayer funded salary, there was in my opinion ONE overriding factor to his speech. IT WAS POLITICAL, AND HE MADE SURE EVERYONE KNEW IT. Why political? Everyone saw in the background a picture of the red bus, hence making it purely political. The fact he allowed it was an error of judgement, but we all know £350m (gross) was in fact a verified underestimate and never promised. Okay, so that's my personal view, but why do I say this? Our NHS is one of the jewels we hold in high esteem. It's all about HEALTH is it not, free at the point of service. The NHS workforce are there because they want to work for the NHS in some capacity, so one may wonder the motives of Sir Stevens. A brief background check shows who he used to work for? We require high standards of the UK medical profession, like being able to speak the language of our country in clear tones the patient understands. Sure there are some problems, as with many large institutions. When do we hear Sir Simon Stevens, MPs, peers, the BBC and others, saying VERY LOUDLY our NHS is a National Health Service, NOT an International Health Service. As it happens, I have a family member working for the NHS on the front-line, and his biggest annoyance when leading his team are the MANY Manager's he often confronts. I say to ALL MPs and peers, be 'grown-up' and STOP USING OUR NHS AS A POLITICAL 'FOOTBALL' about who did or didn't do what? They should STOP attempting to spin our NHS for political gain. In fact, I should like to see the NHS being taken out of politics, as it's there to benefit everyone, regardless of political persuasion? Message: I find it rather amusing that the BBC still believes they are in any way reflecting the populace's viewpoint. BBC political staff such as Laura Kuenssberg regularly seeks to spin Brexit in a negative light and because of this lack of honest journalistic transparency, people have come to realise the BBC is no longer impartial (which can be said of many UK institutions that have some tie in with the EU). Indeed, it is hard to find anyone of my extended family, friends, work colleagues, professional associates or acquaintances that listen to the BBC’s political puerile duplicity without grimacing…similarly C4! I should point out not all of the above persons are Brexiteers, some are Reminders. I do however respect their concerns for the UK leaving the EU and in some cases, I am mildly sympathetic with their wider view of possible dissociation from Europe, if not their irrational logic? However, my point is the BBC political analysis is so negatively and demonstrably delusive towards Brexit as to be completely irrelevant. The BBC no longer has wider political journalistic credibility and is considered by many to be simply an EU media outlet, which produces mendacious EU propaganda and sophistic editorial spin and therefore should be confined to the historical journalistic trash can! These days we hardly bother to read the thoughts of Michel Barnier – or ‘Barney’ as he is known here in the Facts4EU.Org office. Let’s therefore get this out of the way quickly. Barney made a speech in Italy yesterday, and if you really want to, you can read it here. He also made a little statement in Brussels today after the latest 'talks', which you can read here. Below you can watch the statement after the 'talks' - on the left - and the question and answer session which followed - on the right. There. That's our public service journalism work done for the day. Now we would like to make some general points about these 'talks' and about the EU's Chief Negotiator Michel Barnier. In the beginning, the dapper Frenchman Michel Barnier mattered because he was voicing the thoughts of the Commission, the Council, and the EU Parliament. It was important for us to know if there were any nuances over and above what was in the formal documents published by each of these bodies. Nowadays when Barney speaks we have a tendency to doze. The reason is simple. Regrettably he’s not... how shall we put it kindly... Well, he’s not spectacularly interesting to listen to. He lacks a certain intellectual ‘frisson’, as our French friends might say. Poor old Barney rarely allows an independent wrinkle to trouble his immaculately-coiffed visage. Perhaps it helps that he has no electorate to answer to, being an unelected person. In effect he’s a clerk, an embodiment of the étatisme which drains the colours from the EU’s soulless corridors. It’s sad to see Barney still clinging to what he considers to be ‘idées fixes’: the supposed ‘Guiding Principles’ for the Brexit negotiation from the EU Council, bizarre ideas echoed by the hollow minds in the chamber of the EU Parliament. To be fair to him, Barney’s not the only one. The walking Belgian disaster that is Guy Verhopeless suffers from the same cavernous delusions. In the end, as we have always said, these talks will come down to politics. It doesn’t matter what the EU might say in advance, in the end the leaders will do what they want. This will not be what they started with, even though they have tried to proclaim the inviolability of their principles. Over and over, the EU ignores its own laws, its Treaties, its Directives and even its principles such as ‘solidarity’, ‘unity’ and other vague nonsensities such as ‘the Four Freedoms’ which we are forced to hear about on a regular basis. If you want just one tiny fact in this wasteland of opinion, ask yourself where the Schengen area has gone. Supposedly an inviolate concept of a zone where borders no longer exist, it is currently just a memory. Do you remember when it was such a big deal for the UK to negotiate an opt-out from it? Hungary built fences on its borders and was condemned for it. The EU never apologised, but turned the other cheek as more ‘acceptable’ member states raced to copy Hungary’s example and protect their own borders. It’s not what the EU says. It’s what it does. We have no confidence at all that the EU will negotiate sensibly in the end. More than anything, the EU elites are terrified of contagion. If they don't make the UK suffer for Brexit, everyone will want out. Or they'll want an ‘à la carte EU’ or a ‘Common Market EU’ or worse. Enough to make your average Brussels-dweller shudder to his core. We know that the Rt Hon David Davis MP is wasting his time with Barney and we believe the same will be true of the EU Council when they become more involved. And as for the EU Parliament, forget it. We rather suspect Mr Davis has held similar views to us all along. The difference between the Brexit Secretary and ourselves is that we would have refused to play the EU’s silly little game from the word ‘allez’. [ Sources: EU Commission ] As usual, journalists and politicians can contact us for the list of links to the research. Message: Michel Barnier has been known to say some interesting things, for example here he is back in 2012 when he was the EU Commissioner for the Internal Market and produced this report on its economic benefits: https://publications.europa.eu/en/publication-detail/-/publication/c505dbb4-64f1-40a6-8062-ebdea6240bd4 "20 years of the European Single Market" The most interesting claims were on page 13, under “Main Macroeconomic achievements and impact”: The collective GDP of the EU member states in 2008 was 2.13% higher than it would have been if the Single Market had not been launched in 1992. Over the same period, the Single Market helped to create 2.77 million new jobs, a 1.3% increase in employment across the EU. Interestingly those meagre improvements in GDP and employment corresponded to a very much larger increase in the volume of intra-EU goods trade – in other words, thanks to the Single Market a lot more stuff was being shipped around within the EU, but that had not actually made the inhabitants significantly more prosperous. This report did not try to gauge how the average or overall benefit had been distributed across individual EU member states, it was this other source: https://www.bertelsmann-stiftung.de/fileadmin/files/BSt/Publikationen/GrauePublikationen/Policy-Brief-Binnenmarkt-en_NW_02_2014.pdf which suggested that for the UK the gain had been below the EU average, more like 1%. That is the miserable mess of pottage for which our treacherous politicians have been willing to sell our birthright, and even now Remoaners routinely carry on grossly exaggerating the economic effects of the EU and its Single Market. Message: We're learning ever more about the EU commission as their wilful deceit is exposed day after day. Their EU propaganda machine has gone into overdrive with boosters. Michel Barnier has shown the world his REAL intent - HE IS AFTER MORE BRITISH TAXPAYERS MONEY, pure and simple. He appears to believe British people will simply give up. He now presents the UK with an ULTIMATUM (I call it threat), and as a proud Brit I will NOT stand for this. We all remember the ridiculous 'project fear' prior to the referendum [coming from everywhere] which descended into abuse, threats and blackmail, and when that didn't work, the elderly were threatened, and that didn't work either. Mr Barnier must not think British people are stupid and will be threatened in this manner. I wonder if their threats may constitute a 'hate crime'? We fully realise Mr Barnier's words were in the main directed towards a British audience which if it wasn't so serious is almost juvenile. The EU commission appear to believe that by threatening us they think we'll give in. NOT A CHANCE. It appears to me the EU commission have lost the 'plot', for whilst they continue their unhelpful attitude towards the UK, they still DEMAND our £billions, so ALL of us should this weekend remember WHY the likes of Frenchman Mr Barnier live in freedom. He forgets the MILLIONS of British lives lost coming to their aid in TWO world wars. If anything, the EU owes the UK. Let us remember we are a proud nation that stands tall in many ways and will always assist when called upon to do so. Let us remember our Veterans and those now passed, for they defended our country so we may enjoy the freedoms we have today. REMAINERS WANT TO GIVE AWAY OUR COUNTRY AND OUR FREEDOMS. I suggest the UK negotiating team walk away from talks. We don't have to rubbished in such a manner? Message: Thank you for the videos. I listen intently to both and came away with the same feeling as before...the EU is still playing games. I agree this is the right time to stop the negotiations and call the EU's bluff! With each passing "expensive" week, it is becoming crystal clear the EU is not interested in negotiating, but simply wish to demand, which has been their arrogant approach from the outset. This is the same strategy that was used so effectively against Greece. Unfortunately for the EU, the UK is not Greece, made of sterner stuff and on balance is in a much stronger bargaining position. Of course, the EU knows this all too well, hence their uncompromising belligerent stance! However, the more they huff and puff the easier it is to gain the advantage. The old adage: those that shout and scream in negotiations are the ones with the least advantage! Since before the Referendum the EU has lied consistently and brazenly about its role in providing international aid. Here we provide the evidence. The EU uses a graphic in its official documents whenever the subject of international development assistance comes up. This has happened with increasing frequency, as the EU has sought to promote itself in various ways in response to the numerous crises affecting the EU. 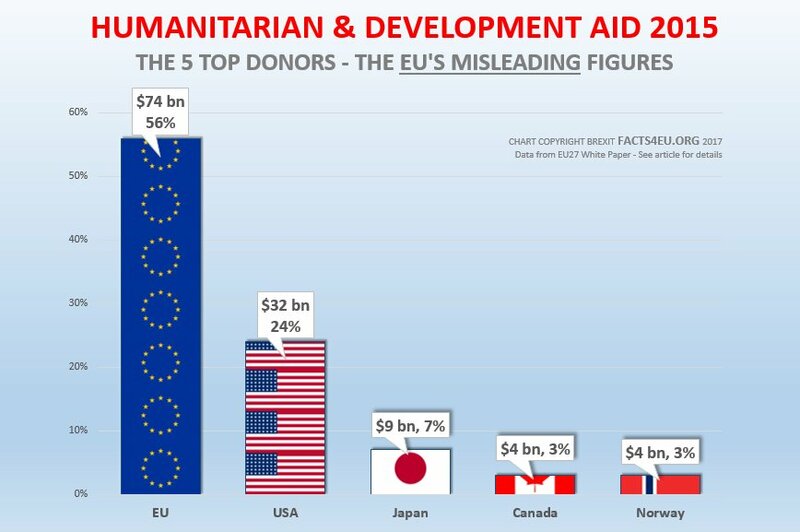 In the graphic, the EU claims to be by far the largest donor of international assistance, giving 56% of world aid. The USA is shown as No.2 and the UK is nowhere. 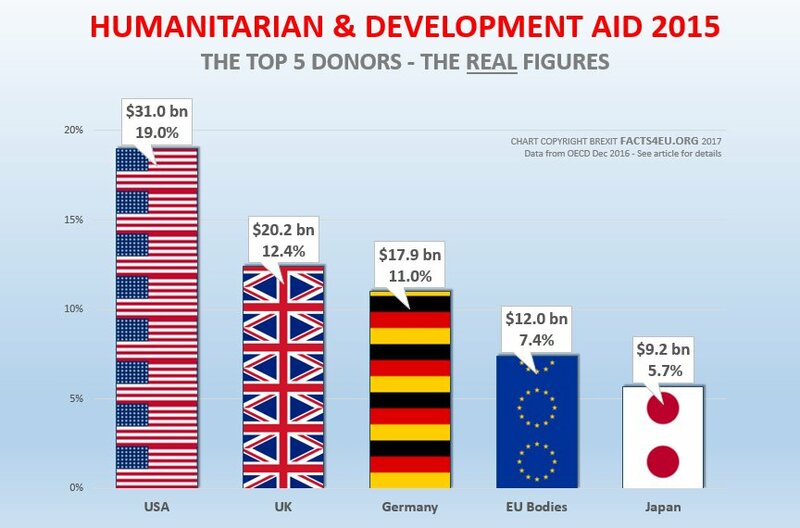 This graphic is clearly trying to show that the EU is the biggest donor of foreign aid in the World. Despite the document being about the EU27, the EU has included the UK in its figures whenever this presents a better picture for the EU, as in this case of foreign aid. You will note that this graphic paints the UK out of the picture entirely. Japan, Norway and Canada get a mention, but not the UK. 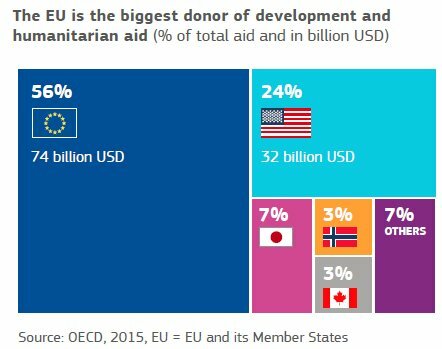 The Paris-based OECD is the definitive source for information on foreign aid, and even the EU claim to have used this data when producing their bizarre graphic. As ever, Facts4EU.Org went to the latest (Dec 2016) raw data from the OECD to bring you the truth. We’ve recreated the EU’s figures into graphs which enable a comparison between the facts, and EU fiction. In presenting the graphs, we accessed the raw data from the OECD – the same organisation that the EU cites as its source. We used the OECD data from Dec 2016, net disbursements in dollars at current prices. We adjusted the figure for the EU as an institution by taking out the element of its total which is attributable to the UK, using 12% as a very conservative average. The precise total may differ slightly but this will not alter the reality. Members of the EU – such as the UK – have their own donor programs. The EU as an institution also takes some of the money given to it by member states and uses this in its own donor program. The EU should simply report its own donations from its own donor program. Even that might be argued to be disingenuous, as the European Union is not a country and the money it donates comes from the member states. Unfortunately the EU takes the amounts of its individual members donated individually - not via the EU and which are unconnected with the EU as an institution – and claims these as part of ‘EU donations’. This means that the UK, which most British adults know to be the second-biggest donor in the World after the USA, disappears entirely from the EU’s graphic of top international donors. The graphic above - and the claim about the EU being the world's biggest donor - is being used in documents and propaganda about the future of the EU as the EU27. In March this year the EU used the graphic prominently in its landmark “White Paper on the future of Europe” and this is the document we referred to above. The EU should of course have entitled the document “the future of the EU27”, not "Europe" which is a continent of some 50 countries. 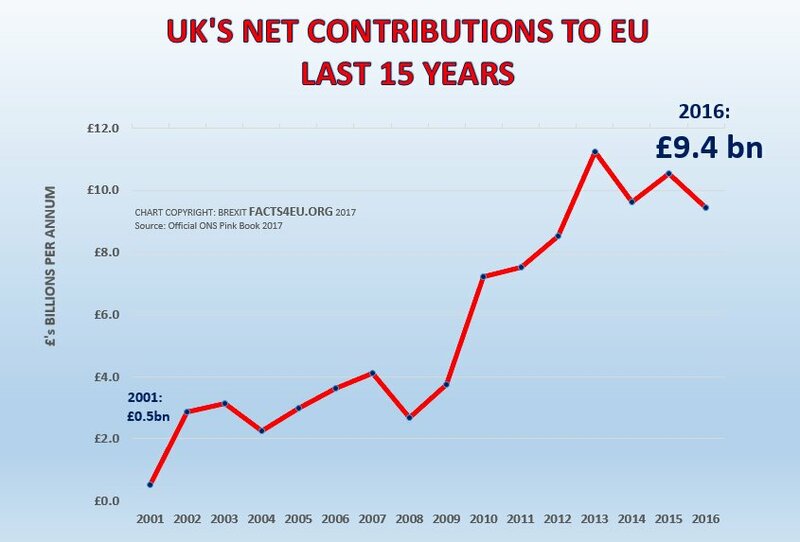 How is it possible that the EU could then use its misleading graphic without pointing out that in fact a large percentage of the donations it is claiming for itself are in fact given by the nation which will not be part of the EU going forward? None of this EU disinformation is hidden. Below is a typical opening of a page about aid on the EU Commission’s website. We have also seen this graphic and the false claim being used in many other EU documents, as well as in its postings on social media. Bear in mind that this EU lie and the graphic which flaunts it are widely distributed by the EU throughout the world. Naturally the graphic is also used to brainwash the young people of the EU countries. Please also be aware that the EU plasters 'from the EU' signs all over donations it makes. This means that in countries in receipt of aid, the recipients see the aid as coming from the EU, when in fact most of it is paid for by the UK and other member states. Yesterday the BBC interviewed Iain Duncan Smith and it was put to him that EU leaders were talking about the fragility of the British government and whether in fact it is going to survive. They are saying that the UK should now postpone Brexit because the government is unstable. Isn't it time for the government to respond rather robustly to the EU on many levels? Perhaps the government might point out that they should keep very quiet about the incident of the British International Development Secretary departing, unless they want to clean up their act over the deliberate disinformation they have been spreading about their own performance in this area? [ Sources: OECD | EU Commission ] As usual, journalists and politicians can contact us for the list of links to the research. Message: It is not so bizarre actually, when you consider the EU's raison d'être is to promote all things EU, producing propaganda graphics to demonstrate to the world at large their "self-importance" effectiveness and their extraordinary self-promoting duplicitous success story. The EU distorts reality in pursuit of their mendacious narrative. This is what the EU marketing spin does...no mystery there! The EU is on the defensive, due to economic realities coming home to roost, and the increased in anti-EU populism. They will resort to political opaqueness, abstruse facts and financial bullying to achieve their clear long-term objectives? To achieve these objectives, the EU political machinery continues to resort to using subtle or non-subtle means to successfully bring about their socialist economics and neo-geographical designs. For example: brainwashing the youth has been a useful technique and one that has yielded a certain amount of success in the past 40 years! Universities are now highly penetrated and indoctrinated, via surreptitious funding/inverse grants/cultural Marxism exploitation leading to PC ubiquity, which represents one such success story for the EU’s ultimate step by step game plan? The European Union is, at every given opportunity, presenting a unified (integrated) European entity. They are, without doubt, completely ignoring national identities now, using extreme instruments for their shameless promulgation. Of course the EU sees the UK as nothing more than a remote island region within the EU Empire, hence why Brexit is such a sensitive fly in the ointment and represents the evil vanguard for the rise in rebellious anti-EU feelings! The UK must be punished at all costs; political marketing spin is one tool to achieve the UK’s political and economic subjugation! The EU has morphed into a Neo-Sovietism construct and is using all the long-established insidious mind game techniques, to destroy sovereign nation-states independence from within! The ‘resignation’ of Mrs Priti Patel yesterday evening has left many papers across the EU once again talking of Mrs May’s ‘weak’ government and how this will make Brexit negotiations even more difficult than they otherwise would be. Mrs May’s majority hasn’t changed. She continues to be Prime Minister and has exactly the same majority in parliament to pass necessary legislation. The return of Mrs Patel to the back benches merely means that a Cabinet Minister is being changed – a regular occurrence in all EU27 governments, although less common in the UK. In fact in many EU countries much larger changes to governments happen far more frequently. Ministers come and go more frequently, and indeed the entire composition of a government can change, when a coalition party decides it no longer wishes to be a part of a coalition government. In the United Kingdom, government is generally comparatively more stable, as the UK does not routinely have governments composed of several smaller parties. Mrs May is currently governing with 42.3% of the popular vote. She obtained this mandate in the last General Election, in April of this year. 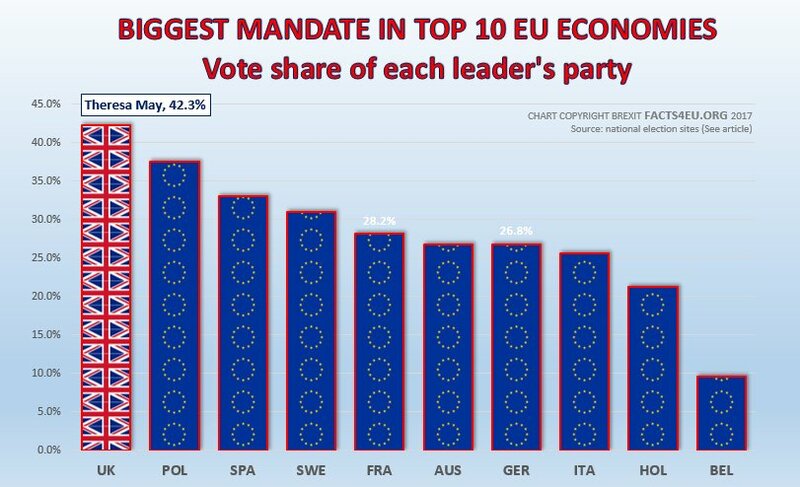 That is the highest mandate of the leaders of all the major economies of the EU28, by some margin. To put this into context for you, Angela Merkel’s party only managed 26.8% in the German elections in September. On 15th March this year the Dutch went to the polls. Just 2.2 million people voted for the party of standing Prime Minister Mark Rutte, giving him only 21.3% of the popular vote. From 15th March 2017 the various Dutch parties held talks, trying to form a new coalition government. Finally on 26th October 2017 a new government was announced. After more than seven months of it sitting in draft form on his computer, EU Council President Tusk was finally able to send his congratulations letter to Prime Minister Rutte. Please remember that Mr Rutte's election result was immediately hailed by the EU in March as a 'victory against the populists'. The German elections took place on 24th September. 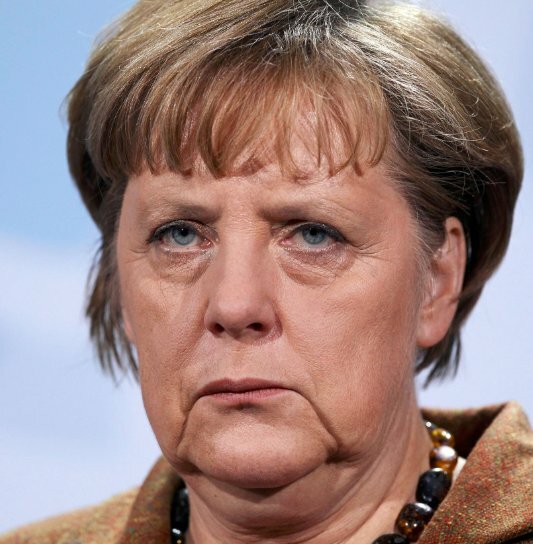 Angela Merkel’s party, the CDU, dropped to only 26.8% of the popular vote. Its combined share of the vote with a party it usually partners with, the CSU of Bavaria, fell to the lowest level since just after the war. Former EU Parliament President Martin Schulz’ socialist party performed even worse than Frau Merkel’s. Following the result he announced that the SPD would not engage in talks with Frau Merkel about forming another coalition. This leaves Germany still without a new coalition government and talks continue between the various parties. With all the constant turmoil in political parties and governments across the EU, the UK’s government looks like a model of stability and good governance. We just thought we should put a little balance into some of the hysteria coming out of Brussels, some EU capitals, and some elements of the British broadcast media and press. Message: You could see it coming. To the Nation, the Prime Minister Theresa May appeared to be two-timing us over Brexit. She has failed us over Brexit with her canoodling up to the EU bureaucrats and unbelievably giving so much away to gain what? A worthless trade arrangement? I see no reason to keep her in the Top Job. How does the system work in this situation? Is it a Vote of No Confidence and a new Conservative Leader then appointed? Or something else? The Conservative Party made a huge error of judgement by appointing Theresa May, who had voted to Stay in the EU Referendum, contrary to the majority of voters. They MUST NOT make the same mistake again otherwise, as a vote-winning Party, they are toast. Message: FACTS4EU must stop bringing incisive clarity, anti-sophistry, anti-delusive commentary, anti-canted rhetorics, anti-ambiguity! Because this will infuriate those that wish to muddy the political waters, continue their mendacious opaqueness and their false Brexit narratives. 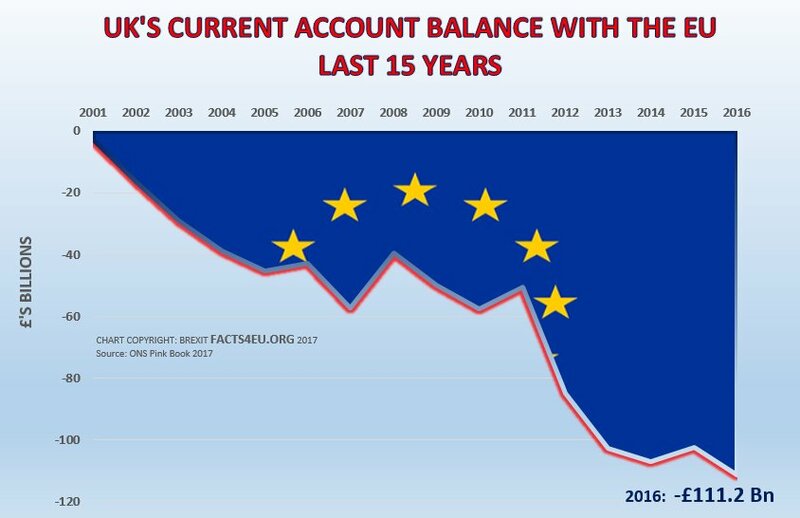 Thank you FACTS4EU for enlightening the populace with your veracity, easy to understand, informative, insightful illustrations! Long may it continue. Readers don't come here to read about politicians' behaviour unless it relates to Brexit. The problem today is that Mrs Priti Patel, Secretary of State for International Development, is one of the very few Brexiteers in Theresa May's cabinet. When she arrives back in the Britain after having been told to cut short her trip to Africa, she will go to 10 Downing Street to be fired. For the sake of good order, no announcement has been made officially but the Prime Minister clearly has no alternative after the latest revelations about further unauthorised meetings Mrs Patel held with politicians and officials of a foreign government. We will not comment on Mrs Patel's actions. Where we have an interest is in the question of who will replace Mrs Patel. No doubt the Prime Minister will be thinking of all kinds of politically-correct factors as she is considering the candidates. She will probably be conscious that Mrs Patel is a woman and is of Ugandan-Asian origin. Facts4EU.Org is colour-blind and gender-oblivious. However when it comes to Brexit and a politician's views on this, we have 20-20 vision. Below is the current share of Leavers and Remainers sitting round Theresa May's Cabinet table. WE CONSIDER THE ABOVE TO BE COMPLETELY UNACCEPTABLE. Mrs May appointed her first cabinet in July last year, after David Cameron had resigned following his Referendum defeat. She then made some small changes following the General Election in June this year, but failed to address the Cabinet's heavy Remain bias. With the resignation of her Defence Secretary Sir Michael Fallon last week, Theresa May had another opportunity but failed to take it, appointing arch-Remainer Gavin Williamson instead. Williamson is a man who doesn't even believe in the Military Covenant, but who was PPS to David Cameron up to and during the Referendum campaign and who ran Theresa May's campaign for the leadership when Cameron quit. The Cabinet isn't even remotely close to representing the country on what is universally accepted to be the most important political matter for generations. Prime Minister, you are currently doing very, very little to impress anyone who voted for Brexit. If you appoint another Remainer into your Cabinet we believe you will have hammered yet another nail in your coffin. Already we receive many emails about you (not for publication) from traditional Conservative voters who will no longer vote Tory. If you don't start doing something right you will lose a great many more. There are decent, knowledgeable and impressive men and women in your parliamentary party, huge brains with great experience like John Redwood, Owen Paterson, David Jones, and Jacob Rees-Mogg who backed Leave in the Referendum and who will no doubt be happy to join the government at this critical time. If you don't know who all of them are we can provide a list for you. You could make a start by appointing a new pro-Brexit MP to Cabinet today. We welcome your comments dear reader, which we will publish below in the grey box below. You can use a pseudonym if you prefer, and it's always nice to know roughly where you're writing from. Please always state the headline of the article you're commenting on. Message: I would very much like to see the Rt Hon Dr John Redwood MP catapulted into the Treasury to take over as 'Chancellor of the Exchequer'? I receive his daily blogs and he ALWAYS talks sense. More importantly, Mr Redwood is a passionate Brexiteer who believes in our country and its future path. 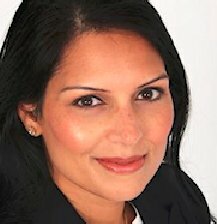 I further believe we need another 100% Brexiteer MP to take over from former Secretary of State for International Development, Mrs Priti Patel MP. The massive Foreign Aid budget needs a radical shake up, and priorities revised. The entire subject of foreign aid NEEDS redefining? Let us use some of it for our struggling NHS? If Theresa May [UK PM] is to survive her premiership, she needs to even up the Cabinet, and fast. Message: Theresa May has been my MP since 1997. I have voted for her on just one occasion, and that was the last election. We have had a few contacts and encounters over the past twenty years; I certainly do not claim to know her, but I have observed her and I know people who have been or still are in the local constituency Tory party. My impression is that she is a decent and well-meaning woman without any extreme political views; she has never come across as a eurofanatic but just as another Tory MP more or less following the prevailing Tory party line on the EU. So I have no great difficulty believing that although she supported Remain, in a lukewarm sort of way, she has fully accepted the result of the referendum and sincerely wants to do her best to implement it. The problem I see is that when that skunk David Cameron broke his word and ran off immediately after losing the referendum she was just about the best available option to hold the Tory party together while trying to carry out the mandate of the referendum but she has now been promoted close to her level of incompetence and is far too prone to take bad, and in some cases badly meant, advice from those around her. She also had the problem that she had to start from scratch because there were no contingency plans for a Leave result. Having said all that, I have to ask who is available to replace her who would be better, and how much time and effort would have to be spent on the distraction of her removal and replacement. That, of course, is what the Remoaners want, which is why they are seeking to cause maximum disruption on all fronts in an attempt to destabilise her and her government. Yesterday we showed how much the EU is costing the UK, using the latest official government data from the ONS. 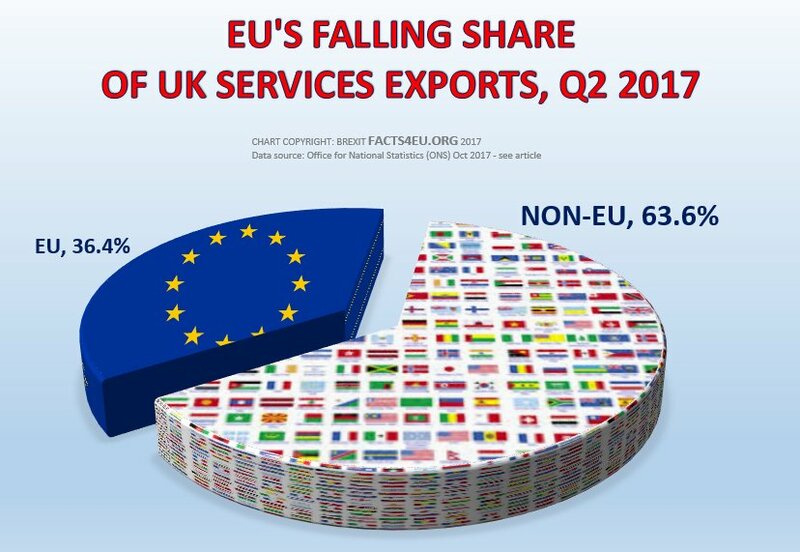 We also showed how the EU is rapidly becoming less and less important to the UK, with its share of British exports of goods and services falling to only 43.1% last year. Today we look specifically at the trade in goods. Even Remoaners are generally forced to admit that the EU27 sell us more goods each year than we sell to them. But just how big is the gap? The answer is that at almost £100bn it’s YAWNING. You will hear politicians and commentators use figures varying from £50bn to £75bn. In fact, at £96.5 the gap is closer to £100bn and it will exceed that figure this year. 2. WHICH EU COUNTRIES DO BEST OUT OF SELLING TO THE UK? Unsurprisingly the largest economy among the EU27 sold the most to the UK last year. However the size of the differential may surprise many people. In fact Germany's performance at selling into the UK may surprise Germans themselves. We have yet to see the British government making the German people aware of this fact. Yesterday we happened to see some anti-Brexit politicians and commentators talking about trade, and they all used the wrong figures. Unfortunately Brexit spokesmen also got it wrong. The true figures are much worse (for the EU) than they indicated so we thought you would want to know them. As with so many aspects of the UK’s relationship with the EU, the truth is really quite shocking. 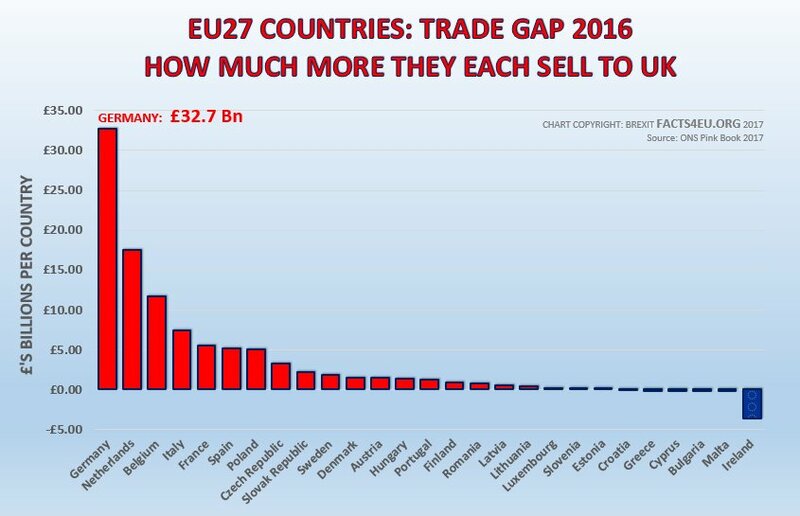 For the EU27 to sell almost £100bn more goods to the UK than the UK sold to the EU27 last year is staggering – or it would be if we were not all so inured to these things. The point we are making is that the benefit the EU27 are getting from the UK’s membership of the EU each year is not marginal – it’s enormous. When you look at the graphs we have produced just in the last two days – to say nothing of the hundreds we have produced before – how is it possible that the EU are demanding huge sums from the UK? And how can they conceivably do this in a form of blackmail, refusing to discuss a future trade deal until the UK agrees to its demands? And more to the point, how is it possible that Mrs May didn’t just laugh in their faces when they first suggested a Brexit Bill? By the government even entertaining the idea of paying the EU anything, they opened Pandora’s box. The problem goes back to when they first acquiesced on the limiting of negotiations to the three points the EU insisted on. In that moment they lost the power balance. Ever since, the EU has simply demanded more and more and has been in complete control of the agenda. To describe the performance of the government as lamentable would not be too harsh in our opinion. At the beginning we were ready to get fully behind the government, even if we had reservations about several aspects of their statements. Over time the performance of the British side has been so poor that we have started considering proposing radical solutions to get things back on track. Our focus has been on the UK’s negotiations and relations with the EU. We have resisted the temptation of commenting on the party political aspects of all this in the UK, because we try to maintain a party-neutral stance. We will just say, however, that we consider the political games that have been played by Remoaner politicians and by self-publicists like Ms Miller and various lawyers, academics and 'celebrities' have been truly appalling. We are very interested to hear from you. What do you think of where the UK has got to? What do you think of the government's proposed transition period during which the UK will effectively still be in the EU for two years or a lot more? What do you think of the £53bn the Prime Minister is alleged to have quietly offered to the EU, according to the latest leaks? Message: I should like to remind readers of a previous and VERY important Facts4eu observation from 28th March 2017, where: "After 43 years of being heavily and generously subsidised by the UK, the UK has decided to stop giving". "And the EU wants to present a bill for this". As Facts4eu rightly pointed out, the UK has been a NET contributor EVERY year except for one in the 1970's. When Article 50 was hand delivered the clock started ticking, and it was understood by EVERYONE a two year transition period had begun. To my mind, this transition period will time-out at the end of March 2019, with or without a deal, at which point we exit the European political union. No further transition period is necessary for that keeps us shackled to the EU. Remember, the EU will do all they can [by whatever method] to keep us shelling out £billions to them. If Sir James Dyson and others are happy with no deal, then so too am I. As I have said for decades, we do NOT need political union with the continent in order to trade with them. Mrs May should in my opinion be withholding the excess £10 billion each year following Article 50 [formal notification] to the EU commission. Consider this, you close your bank account - you don't then continue paying into it, and the bank doesn't bill you for leaving. You change energy supplier, you don't get billed for leaving, and so on. In my considered opinion, the EEC/EU construct is the biggest rip-off in our history (probably), and I'm fed up with hearing constant moaning from the EU, and from remainers. The UK is leaving - GET USED TO IT? Message: What progress? 1. We appear to be offering to pay a rumoured £53 billion to the EU. What for and what, if anything, are we expecting to get for this extortion? As I understand it, there is no basis, either legal or moral with which to justify any such payment to the EU. Should any payment be made, a large proportion of the money would have to be borrowed, with responsibility for repayments of both interest and capital falling on our children and grandchildren. 2. From the reports which I read from various websites, it seems that undisclosed and hidden negotiations are taking place behind our backs to integrate the British armed forces onto a proposed EU "defence" force, with control of this force being by Brussels. If this is true, then it would be a big step in the wrong direction - we are after all supposed to be leaving, rather than getting more closely integrated with the EU. Such a step would mean that we are no longer a sovereign country and a great deal of the "Leave" vote was because a lot of people wanted us to be able govern our own country, which cannot be done without an armed force under our control. How safe would you feel if Brussels had control over our nuclear capability? 3. Transition period. Why should a transition period be necessary? A very clear mandate was given by the voters of this country in June 2016 and it was certainly not to faff about with transition periods, but to leave the EU as soon as possible. If there are businesses which cannot cope with adapting to the changed circumstances after having had nearly three years in which to do so, then perhaps one should query whether they should be in business. It may be that a transition period is being mooted in the hope of trying to change the minds of the electorate regarding Brexit - this is a false hope as the desire for full independence from the EU is very unlikely to go away. 4. There is very little doubt that the structure and aims if the EU are in fact almost a carbon copy of the plan Hitler had devised for when he had conquered the whole of Europe, and indeed history shows that the EU was largely devised and initiated by "ex-Nazis". Are we really sure that we want anything to do with that sort of set-up? 5. We need to get our heads together and to work together to make Brexit a success. It does nor auger well that we gave a weak and vacillating Prime Minister, who has seen fit to appoint a Cabinet with a majority of Remainers in it - she would do well to remember that election time comes around in due course, when her performance (or lack of it!) will be held to account. Message: Where in the Referendum did it say we wanted to continue trade with the EU? It did not. It was a straight Stay or Leave. What is happening now is not in accordance with what we, the British Nation, voted for. 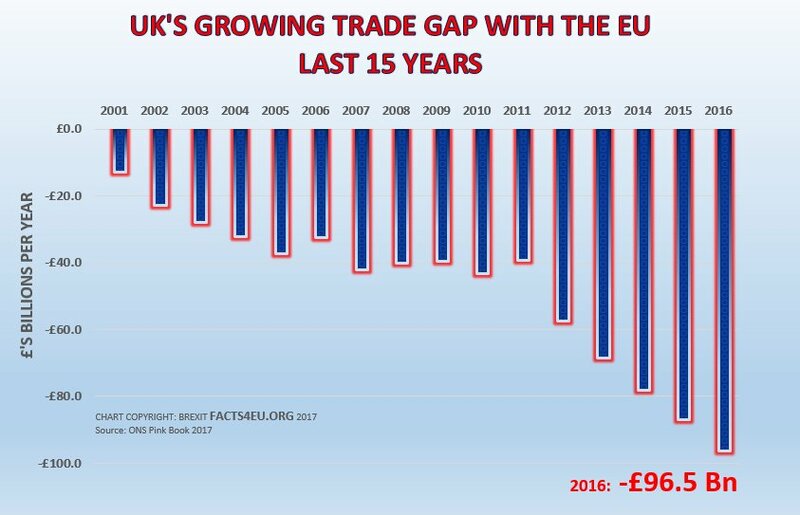 Now, Facts 4EU, you have published the truly shocking and abysmal figures on Britain's trade deficit with the EU, plus the sickenly massive sums we pay in to the EU coffers for nothing in return, you have proven that the British people have been misled by a series of Governments and Prime Ministers for nearly 40 years. And this deceit continues today. Big question: Why do Remainer Theresa May and her Remainer dominated Cabinet want us to continue EU trade when THEY KNOW WE HAVE A YEARLY DEFICIT OF CLOSE ON £100 billion? Facts 4EU, you published facts on how British firms very rarely get tendered Contracts for new projects. Another massive loss to us, and the British workforce. Remainer Theresa May and her personally-selected Remainer dominated Cabinet, are offering to throw away British Taxpayers' money, latest figure around £50 BILLION, to the EU when THEY KNOW THERE IS NO LEGAL OBLIGATION TO DO SO. And knowing we have been the 2nd largest contributor to EU funds for decades. Neither has PM Theresa May come clean with her own Parliament Members on Britain's signing up to a new EU Defence Force. Since taking office, the PM has signed up to further agreements and omitted to report back to Parliament on another major EU Meeting she attended. Why? Could it be she, and by inference her Conservative Party, never intend us to separate from the EU? Can it be our Remainer voter Prime Minister is really so inept? I don't believe so. The more likely reason is Mrs May, and possibly her Party, has pretended to us all along about carrying out the Nation's wishes. If so, she/they are denying us our rights, post Referendum, to have our wishes carried out, without fear or favour. That is what 'Traitor' means. Whichever reason for Mrs May's failures, is this person, or Party, capable to lead Great Britain safely out of the EU's entangled web of intrigue? The clock has now definitely stopped ticking. Time is up. Time for positive action. Time to work on opportunities outside the EU post- March 2019. We will 'march' into a life best served by our long-standing British Democratic system and trading with the wider World. Message: The unnecessary Brexit negotiations demanded by the EU have descended into farce... it is time to carefully fold up the paperwork, pop it into the dustbin of history and walk away. We have analysed the Government’s ‘Pink Book’ and ‘Blue Book’ for 2016 which were released last week. Below are three big, fat, juicy facts for you, which you can use with total confidence. The Pink and Blue Books are like the Government’s set of annual accounts. They're about as official as you can get, so if you want to quote facts to a Remoaner you are on the safest possible ground if they come from these sources. This was a figure which was constantly used throughout the Referendum last year. People like us used to write “the EU only buys about 44%, and it’s dropping”. We were right. The Remainers regularly used to say that “the EU buys 50%”. They were wrong. We also pointed out that a lot of trade in goods that shows in official figures as going to the EU is in fact only going only to the ports of the Netherlands and Belgium, for onward travel to the rest of the World. In other words the trade going to the EU as a final destination is even less than 43.1%. The current account balance is quite important for economists. One way of looking at this is to think of it like the total of payments for everything you’ve bought and sold in a year, together with other items like mortgage payments. You end up with a balance at the end of the year. In the case of the UK’s dealings with the EU alone, if you look at all transactions you end up with a massive deficit of £111bn. The subject of the UK’s net contributions to the EU was another cause of great controversy in the Referendum campaign last year. Over and over we stated that a figure of £10bn per annum was safe to use. We stand by this. In 2015 – the year for which some data was available at that time – the UK’s net contributions were shown by the ONS as being £10.6bn. We must also add our regular point which the ONS has yet to take on board. Over recent years there are several major EU funds which have appeared, to which the UK contributes and which are “off the books”. In other words these funds are not part of the strictly-defined EU budget line items and they are therefore not shown by the government as being EU contributions. The reality is that these EU funds exist and are costing the UK hundreds of millions of pounds per year. The UK’s contributions to them should be added to the ‘net contributions’ figures reported by the ONS. WHY ARE ANY OF THESE FIGURES IMPORTANT? So much of the argument from those unwilling to accept the Referendum result continues to overstate the importance of the EU to the UK. Of course the EU27 are important customers. But they’re not the ‘be all and end all’ that Remoaners would have you believe. The rest of the World represents a bigger share of the UK’s customer base and it’s growing faster than the EU. Indeed a very positive way of looking at exports is to say that the rest of the world has shown itself keen to buy more and more goods and services from the UK this century. Non-EU countries now represent almost 57% of UK exports, up from only 43% fifteen years earlier. When it comes to the amounts which the UK is paying to the EU each year, these are simply breathtaking. Forget anything appearing on the side of a bus, are Remainers really saying that they couldn’t think of excellent ways to spend all that money when we no longer have to give it to the EU each year to subsidise its profligate lifestyle? We want to be clear, the facts in our article above are indisputable. 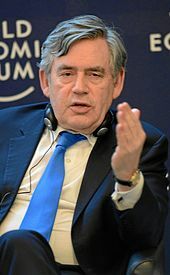 It is the case that organisations such as the BBC, the Financial Times, and Osborne's Evening Standard continue to pump out defeatist propaganda, giving the impression to the British public – and to the rest of the World including the EU27 – that the UK is some insignificant little bit-part player on the world stage. It isn’t. The UK is the fifth largest economy in the world. It’s a country which is respected across the globe and it’s a Top 5 diplomatic and military power. Following Brexit, the world is our oyster. The United Kingdom’s young people can be enthusiastic about going out there like their forebears and further enhancing the reputation of our great country for innovation, trade, culture and decent values. We do, however, need a Prime Minister who can stand tall and who understands the world outside the parochial Westminster. Mrs May needs to lift her head, act confident, and learn something about international and trade relations. If she can’t do that very quickly, then it is our opinion that she needs to move over and make way for someone who can. Message: Can you imagine the picture right now - remain MPs and peers struggling to find the words in a weird attempt to spin this unequivocal news. I mean no disrespect to remain MPs or peers, but respect works both ways, and it's about time they stopped political posturing and ALL of them get behind our country. They MUST accept facts are facts - and that's what remainers were all shouting they wanted. So when presented with facts, they try to dismiss them! May I refer Facts4eu readers to a September 2017 Facts4eu article which I think adds weight to the above article: "EU admits UK pays 26% - 57% MORE than remain claimed." Where the EU's Budget Commissioner, Mr Gunther Oettinger stated: When we lose our British friends, we will lose 12-15 billion euros per annum in various areas because despite the rebate the British were NET payers." 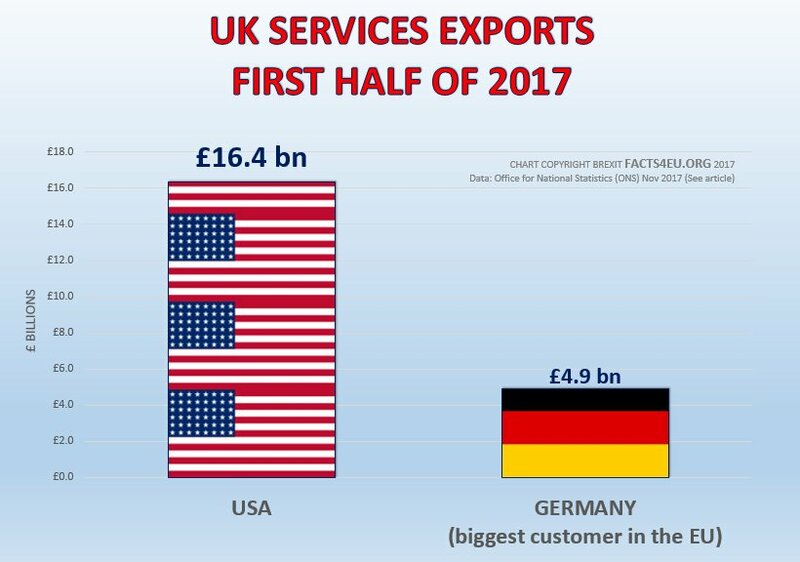 Appears to me as the UK is Germany's largest export market (also shown in a previous Facts4eu article), they should give serious consideration about how they wish to continue business with the UK? I am not afraid of moving onto WTO terms with the EU as I believe it may better suit our purpose. Remainers should remember we already use WTO with the rest of the world. There is nothing to be frightened about. Consider this, WHY should we in the UK allow 27 foreign countries to DICTATE our exit from their political union, when all we want to do is get on with being a sovereign and independent global trading nation, without being subservient to an unaccountable foreign elite? Message: Excellent facts based article. There is no doubt Europe and the UK are inextricably linked and still crucially important to the UK. Being good neighbours, we must continue to develop our relationship post Brexit with each European country What is becoming very clear is this increasing unbridled cost to the UK Taxpayer, in supporting a grossly profligate and insidious bureaucratic EU club membership: Your points are very incisive: 1. The UK’s exports to the EU club are declining each year 2. The UK's exports to the Rest of the World is rapidly increasing each year; without a club membership fee or imposed legal and commercial restrictions! 3. The UK's astronomical membership fee which brings no tangible benefits other than a dysfunctional, ineffectual and incompetent management! 4. The EU's push for a "frightening" Federal Super State that is, perhaps, the greatest danger to European unity and stability? The Brexit argument is one of research and evidential facts versus Remainers' unintelligible, sciolistic and highly emotive narratives, with little or no tangible evidence offered in support of their case for remaining in the EU? FACTS4EU bringing these researched salient points out into the open will assist the Brexit argument to become more widely accepted, in terms of better understanding the EU's deliberate opaqueness, cronyism, exorbitant costs and wasteful institutional projects, and the mendacious Remainers rhetorical sophistry! Thank you. Message: Your efforts are very much appreciated, but the question always in my mind is why on earth the government department charged with executing our withdrawal from the EU cannot be bothered to respond to any of the anti-Brexit rubbish which is being churned out by the media day after day. For years before the referendum the official government policy was that we should stay in the EU and the government had no scruples about spending taxpayers' money to defend and promote that policy with the public. Now the official government policy is that we will leave the EU but the government is doing next to nothing to defend and promote that new policy with the public. It's almost as though they are hoping that public opinion will swing so sharply against withdrawal that they will have an excuse to reverse the policy and keep us in the EU. Message: Do the UK's net contribution figures, include all the "off balance sheet side contributions", like the EU army, the EU foreign aid budget, and other payments that are made to "ongoing projects"? For years these stealth "projects" have been going on and financed by members, without any notification to national Parliaments. When did the British people officially learn about the 'EU army'? I remember a certain Mr Clegg saying in April 2014 forming an EU army was "dangerous fantasy lie, it is simply not true". Then the EU army headquarters, personnel, uniform, equipment complete with EU logo, was unveiled in November 2016. Just like that! Does anybody believe that an army was created in just 2 years, without the Deputy Prime Minister of the second biggest contributors to the budget not knowing. The sooner we leave and get back our sovereignty the better, then Government spending can be scrutinized and debated in Parliament. Governments have no money, they confiscate it from us by taxing. We have the right to make sure taxes are spent well, or we vote them out. Wednesday last week was a significant day in the history of Ulaanbaatar. 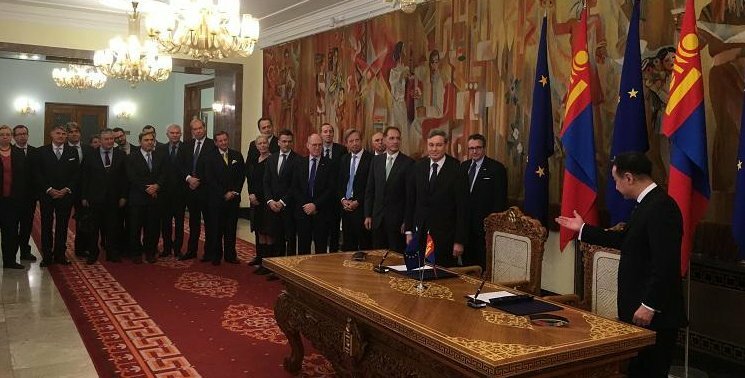 The government based in the capital of Mongolia was celebrating the ratification by all EU member states of the EU’s latest “trade deal”. The EU’s Partnership and Cooperation Agreement (PCA) with Mongolia came into force on 1st November, replacing the 1993 Agreement on trade and economic cooperation between what was then the European Economic Community and Mongolia. GDP : USD $11 bn (£8.4bn). That’s 0.4% of the UK’s. The new EU Partnership and Cooperation Agreement was in fact signed on 30th April 2013. It has taken four and a half years to get it ratified by all 28 member states of the EU. “The European Union and Mongolia are consolidating their strong ties, based on shared values and interests, and a common will to work more closely together,” said Federica Mogherini, the EU’s de facto Foreign Secretary. The Parties shall endeavour to facilitate the movement of capital in order to promote the objectives of the Agreement. The Parties shall encourage the regional development policy. As one of the poorest countries in the world, (ranked 131st by the IMF), Mongolia already benefits from an advantageous trade arrangement with the EU known as GPA+. There are 22 delegates from the EU in the picture above and just one Mongolian. It was taken on Thursday in the capital Ulaanbaatar at the ceremony to establish the EU’s ‘Delegation to Mongolia’. We have other pictures where over 30 EU officials are present. The new EU Ambassador is Herr Hans Dietmar Schweisgut, who has been awarded with the Order of the Polar Star by Mongolian President, the highest honour that can be given to a foreigner. The EU announced with great pride that this is the EU’s 140th Delegation around the world. So, last week Mongolia, this week the World? There are a number of observations we could make about this news from the EU last week. We could point out that this country will no doubt now be added to the list of coutries with whom the EU has a “trade agreement”. Oh yes, the EU classifies a ‘Partnership and Cooperation Agreement’ as one of the 3 types of trade agreements it has around the world. We could also point out that if you read this agreement (we have, alas) it is vaguely worded and is mostly to do with intentions rather than actions, and with political matters rather than commercial ones. So much of the document is waffle and announces grand aspirations on the social level. We very much doubt that the average animal herder will care too much about Millennium Development Goals, for example. On the subject of animal herders, the following may interest you. Winters are often harsh in Mongolia, where there is a climatic phenomenon known as “Dzud”. Earlier this year, the European Commission provided over €115,000 EUR in humanitarian funding for herders because of the cold winter. The Commission gave this as emergency funding because of the extreme conditions. 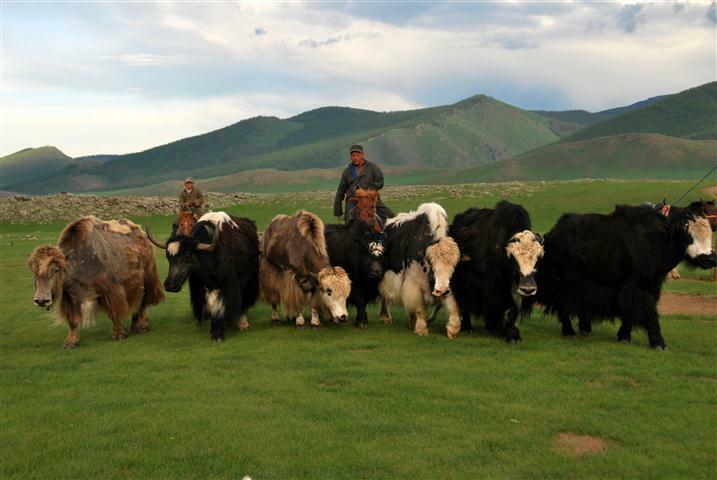 The only problem is that the EU’s own Delegation noted that “The Dzud, characterised by a prolonged summer drought followed by severe winter conditions, is not uncommon in Mongolia.” It admitted that the Commission had already provided €420,000 EUR in 2015. These are not large sums on their own, admittedly, but if the EU were to provide financial assistance to every country that asked for it, for regular weather conditions, we wonder just how big the taxpayers’ bill would become. The point of our occasional articles like these - on news which no-one else covers - is not because of the precise details of each story. These articles taken together enable readers to form a picture in their minds of the mentality of the people running the European Union. The articles also demonstrate the sense of priorities of the EU elites, where ordinary people’s livelihoods take second place to political considerations. And of course they also help you to realise where the vast amounts of taxpayers’ money are going. If more Remoaners knew something about the EU and what it really does, instead of making sweeping statements of what it hopes the EU does and how it hopes that the UK benefits, the Remoaners might realise that the wonderful organisation they support is in fact a severe disappointment. The EU has its own agenda. It’s not the agenda of the British people. Nor, we believe, is it the agenda of the majority of people around the EU. Saying that the EU delivers great benefits that we can’t live without doesn’t make that true. You need to back up assertions like that with facts. And the Remoaners can’t. Interestingly we're seeing more and more people who voted Remain (which is very different from being a 'Remoaner' or 'Reverser') now saying that they back Brexit, as they are starting to see just how much they were deceived about the EU over the last 40 years. We believe that this is what's called ‘a positive note to end on’! Message: Mongolia - Amazing! I read your site every day and this is my first comment. I just wanted to say that it amazes me how I come to your site each morning never knowing what I'll read about. You never just reproduce what I can read about anywhere, BrexitCentral or wherever. With Brexit Facts4EU I get something original and stimulating and there's always a point to it. So when you answer your own question "What's the point?" above I agree with everything you write. It really does teach us something about the EU each time and why we need to be out of it asap. Your research astounds me and my wife and we don't know how you find such interesting things to write about, and all the backing information to go with it. I can imagine it must take a long time, particularly when you often produce such clear graphs to go with things to make the points obvious. We've just sent you a little donation. It's not much but I suppose if everyone did that then you'd get by. I do post links to your articles on other sites sometimes so I hope that helps too. All the best and thank you from the bottom of our hearts for carrying on the fight. Hope I don't embarrass you! Message: I wonder how long it may take for the people of Mongolia to realise that at some point the Brussels machine will start telling them what they may and may not do. This article shows how desperate EU elites are to try and prove their worth. The more they try simply exposes them. The detail regarding "Dzud" was enlightening and brilliant (just imagine the EU in panic mode if the overdue ice-age ever arrives)! Do people actually realise that for every EU scheme in any EU member country, dubious or otherwise, the UK is the second highest contributor to them? Have remainers yet woken up to the fact the money returned by the EU is British taxpayers money in the first place, which the EU rebrand as 'EU money'? It is interesting to note that whilst the European Union are falling over themselves to cooperate with Mongolia, they have little interest in cooperating with the UK. For that reason alone, I should very much like to hear Mrs May [UK PM] and her team changing the rhetoric somewhat. Rather than the UK cooperating with the EU, let us suggest IF the European Union wish to continue good access to UK markets, THEY should be falling over themselves to cooperate with the UK as we exit? Of course, the ideal scenario would be mutually beneficial to everyone, but without the UK being an EU member, or being governed by them. Unlike the EU, the UK does NOT seek to 'punish' anyone, for that is not our resolve. A little known fact about EU membership is the EU’s control over the public sector’s contracts of each country – at least when countries obey the rules, as the UK does. Government and local authority spending must be put out for tender to all EU countries. This is a huge sum each year – 13.6% of UK GDP in the last report by the EU published at the end of last year. In cash terms, this related to €350 billion for the UK’s contracts alone, and that was without utilities like water and electricity, and without defence contracts. Put simply, the UK public sector is a potential goldmine for the EU. 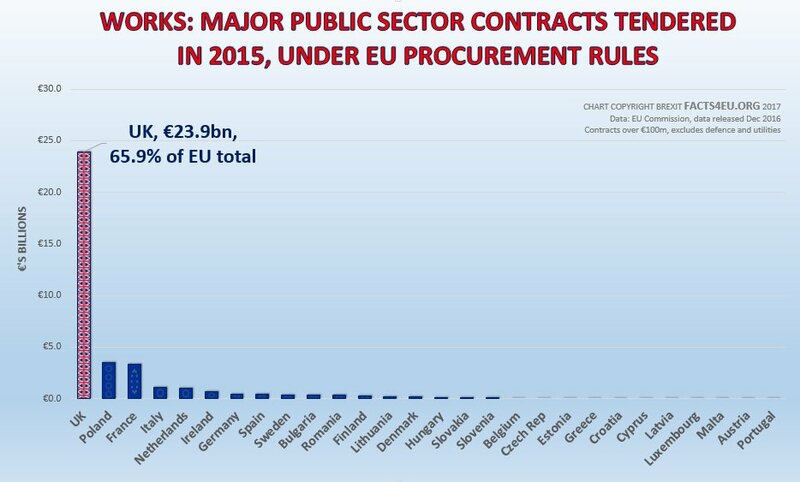 Forced to put its public sector contracts out to tender to the whole of the EU, the UK has done what it was told. The list of directives and regulations which the UK and all EU27 countries are supposed to obey in respect of public procurement is now lengthy. Every country in the EU is supposed to obey the rules above. However as with so much in the EU, the reality is different. Late last year we took a look at how well each country is doing in fulfilling this obligation. We reviewed the EU's four key criteria. These are: not having more than one bidder; not even calling for bids; not buying in bulk; and having ‘special reasons’ for awarding a contract. These four key criteria were defined by the EU’s regulations. While the UK remains a member of the EU, it must strive to obey EU laws and directives. It seems other EU countries are less concerned about these rules. SO HOW MUCH IS THE EU MAKING FROM THE UK? 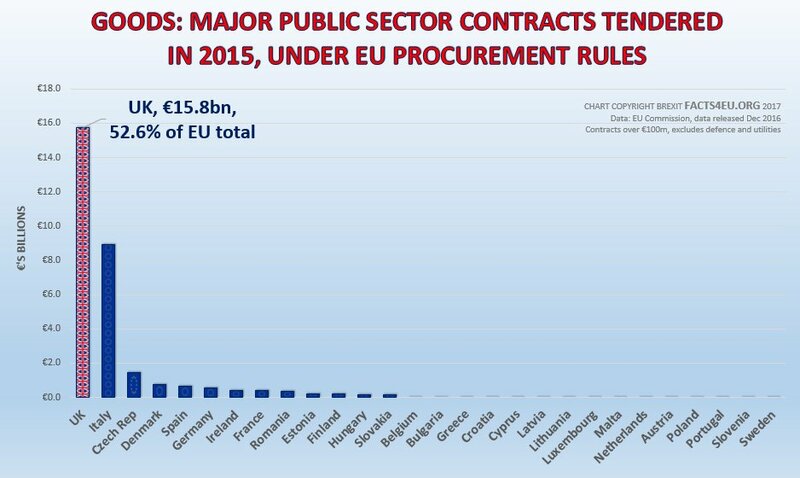 The UK provides by far the largest honey-pot of public projects for other EU states to bid for. Tenders must be advertised centrally and must comply with an enormous number of rules. Whilst information on the proportions of tenders which are won by cross-border bids is not available, we do know just how much business is on offer from the UK, as a result of the EU’s public procurement rules. In the last year for which the EU has published data (2015), the UK’s major works, goods and services contracts advertised to the EU amounted to €73.8 billion euros, or approximately £65 billion sterling. As you can see, the UK once again seems to be in the forefront of things for the EU. No wonder the EU Parliament is already looking at ways of keeping the UK inside the EU's public procurement regulations after it leaves. Certainly the UK will still have to abide by them under Mrs May's 'transition period' plan for at least two years after it notionally leaves. 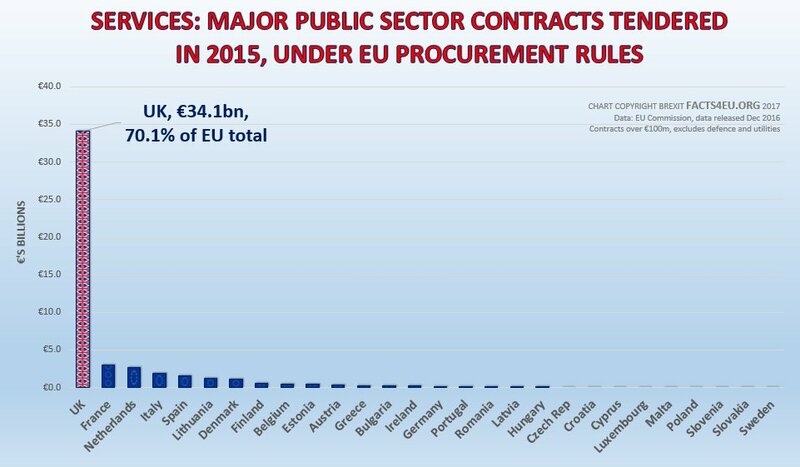 Whilst it's difficult to give you information on exactly how much EU companies are benefiting in winning major public supply contracts in the UK, it must be substantial. You only have to look at the fact that most of our energy companies seem to be French-owned and even some of our armoured vehicles for the army are coming from Germany. Message: More fool the British Government for complying with the Public Tendering rules. If this website can analysis the tendering procedures, and why British companies were not getting their share of other countries' EU contracts, then so could somebody in Whitehall. We have observed time and time again how EU companies have taken over British utilities like water, electricity but other EU utility companies were never for sale! We were told the UK was not competitive enough, not that it was a rigged system. Even now we are buying steel for our new submarines from France, what's wrong with Port Talbot? Wrong sort of steel? Enough is enough just get us out of this thieving cartel, the EU. We will be more than able to survive and prosper despite them. Message: The above article shows the UK has abided by 'EU rules' where many other European Union member countries have not. One must question WHY this is? Could it be other member countries do not agree with EU directives and put their own countries first? Could there be a groundswell of public discontent across continental Europe suggesting the populous refuse to be governed by the unelected in what has become a dictatorial bloc, where powers have been taken (or given) away from nation states and centralised into an unaccountable elite? It is clear more than ever before the EU commission regard the UK as their 'cash-cow'. The UK majority said "enough is enough" as we have our own issues. The EU 'love' us so much they intend to try and punish our great country for having the audacity to take the democratic exit route, to show other member countries they would be punished if they dared to exit the European Union. The UK will not be threatened in this manner, and only serves to show we were correct with Brexit. It is time we turned the tables and TOLD the EU commission what we're doing, and when we're going to do it. We should not hang around whilst the EU play games. The UK is organising its own future. It is also clear the UK, presently the second highest NET contributor to the EU, is funding our competitors. In other words, whilst the UK needs to maintain roads and footways, for example, the EU uses our money funding roads in Poland! It begs the question as to why we have a massive foreign aid budget? One has to ask UK [elected] politicians therefore, in whose interests do they give away British taxpayers money without first addressing domestic issues here at home? "The EU and Cuba are truly turning a page, and the new chapter of our partnership begins now" – Federica Mogherini. An interesting confluence arose this week, seemingly unseen by all the mainstream media. This week the EU signed a “Political Dialogue and Cooperation Agreement” with Cuba. Previously the EU has not had close relations due to the Spanish-speaking island’s very poor record on human rights, imprisoning politicians and journalists among other things. In 2010, an EU parliamentary resolution was adopted which called on Cuba immediately to release its political prisoners. “We cannot afford another death in Cuba. We call for the immediate release of all political prisoners,” said the EU Parliament’s President at the time. Coincidentally, this spat occurred at a time when the Spanish government from Madrid held the EU's rotating presidency. It was taking steps intended to lead to the normalisation of relations between the EU and Spanish-speaking Cuba. In the end it was unable to achieve much during its six-month tenure, but seven years later a major step forward has now been taken. This is despite the fact that serious concerns still exist about Cuba’s human rights record. The last item is a little odd, given that the EU already has a trade agreement with CARIFORUM – the grouping of 15 Caribbean countries plus the Dominican Republic – and Cuba is a member of that trade grouping. Nevertheless the new EU-Cuba agreement entered into force on 1st November this week, although it cannot be fully applied until all member states ratify it, a process which can take several years. Cuba is the largest island in the Caribbean, with an area of over 42,000 sq miles and over 11.2 million inhabitants. It’s GDP is approximately £66bn, which is around 3% of the size of the UK economy. It is 4,855 miles from Brussels to Havana, a journey that takes around 12 hours’ flying time. The Cuban government has been accused of numerous human rights abuses including torture, arbitrary imprisonment, unfair trials, and extrajudicial executions. Human Rights Watch has stated that “Cubans are systematically denied basic rights to free expression, association, assembly, privacy, movement, and due process of law”. This was another week when the situation in Spain appeared from the outside to resemble more and more a political dictatorship, with dissent cracked down upon by the use of an arrest warrant being issued for the Catalan president and senior parliamentarians being imprisoned for their beliefs and actions. The timing was therefore perhaps unfortunate for the EU to announce that it was now glossing over decades of human rights abuses in a former Spanish colony. The Communist island of Cuba has yet to show significant and lasting change since the death of its dictator Fidel Castro last year. It certainly didn’t help when his brother Raul took power following the death of Fidel. Despite this, it seems that the EU is determined to embrace the Marxist-Leninist state of Cuba. The Italian former Communist Federica Mogherini is the unelected de facto Foreign and Defence Secretary of the EU. Think of the roles of the UK’s Foreign Secretary Boris Johnson, and the newly appointed Defence Secretary Gavin Williamson, all rolled into one and you have just part of the power of Ms Mogherini. Call us old-fashioned, but we can't help wondering what on earth the EU thinks it's doing, playing world politics when there are so many crises at home to deal with. Political earthquakes are occurring across the European continent, Brexit is about to redefine the EU in drastic fashion, and one of the EU's biggest members is in a profound civil and political crisis. The video we brought you above is in our view a perfect example of the hideous form of propaganda now being churned out continuously by the EU to influence the young people of the EU. We know that we're increasingly read by the public and politicians from outside the UK. We hope the above perspective is useful. At least one thing is for sure. The EU elites now have another all-expenses-paid, long-distance holiday destination, to escape those long, cold, winter nights in Brussels. Message: Well done for finding a photo of our ex-commie High Representative smiling. She must have felt relaxed and happy with her fellow commissars. Yesterday the Prime Minister Theresa May had yet another opportunity to address the extreme Remain bias of her Cabinet. She appointed her first cabinet in July last year, after David Cameron had resigned following his Referendum defeat. She then made some small changes following the General Election in June this year. With the resignation of her Defence Secretary Sir Michael Fallon yesterday, Theresa May had another opportunity to address the 74% Remainer bias of those who sit around her Cabinet table each week. Regrettably she appointed another Remainer, Gavin Williamson, to the Cabinet. Here is the current state of play as of yesterday. WE MUST ASK: IS THE ABOVE IN ANY WAY REASONABLE? Williamson has always been a Remainer – perhaps not surprising for someone who carried bags for David Cameron as his Parliamentary Private Secretary in the last three years of Cameron’s premiership. On military matters it would be interesting to be present when military chiefs ask Mr Williamson about his views on the Military Covenant. The new Defence Secretary voted against the Military Covenant on all three votes on it in the House of Commons. Replacing Gavin Williamson as Chief Whip is, as you might have guessed, another Remain-supporting MP. The new Chief Whip Julian Smith MP is so keen on the EU that he still has his pre-Referendum EU statement on his website, full of admiration for the structures of Brussels. It is topped by an enormous EU flag. "I was abused during the campaign and it is the first time I have felt threatened in Skipton since being elected as MP in 2010," said Mr Smith. "Hate crimes and racial abuse are criminal acts and need to be reported to the police... Reports of hate crimes are very, very disturbing and it is the first time we have heard them to this degree. It is really important that everyone – individuals, businesses, restaurants and shops – report these crimes. We need to bring some focus to the issue." Mr Smith said constituents had raised concerns about racial abuse during recent surgeries, but declined to give exact details. Mr Smith tweeted "depressing to hear today of further hate crimes in #skipton following #euref. Completely unacceptable & shd be reported to @NYorksPolice". Unfortunately for Mr Smith, his local paper reports Inspector Geoff Crocker of Skipton Police as saying: "We have seen nothing extra on hate crimes here in Craven. We have had one hate crime recorded since the vote." And Mohammed Shabir, from the Skipton Islamic Society, said he, too, was unaware of any racial hate crimes locally in the wake of the referendum. Defence is one of the great offices of state. Mrs May has now appointed a personal supporter as Secretary of State for Defence. This is the man who ran her internal campaign to become party leader. He is a man with no defence experience and no ministerial experience. He is also clearly a Remainer. Interestingly Williamson suddenly wasn’t present for any EU debates in parliament for six months from the week before the Referendum until just before Christmas last year. Since then he has dutifully followed the government line in all votes. Perhaps he still thought it possible that the result would be overturned, so he preferred to keep below the radar. Then in December when Theresa May finally announced that she would invoke Article 50 in March of this year, he started voting yes in Brexit votes for the first time. This matters for Brexit because of the government continuously and secretively backing new EU common defence initiatives since the Referendum. It seems determined to lock the UK’s armed forces inside EU command, policy and expenditure structures after the UK has left the EU. Regular readers will know that we had no confidence in the previous Secretary of Defence, Sir Michael Fallon, and we wrote an article on him as recently as last Sunday. Regrettably the new Secretary of State has never shown the slightest interest in the armed forces or in defence. He has never even been a minister of any kind. And he’s an ardent Remainer. So, we have a Prime Minister with no interest in Her Majesty’s armed forces. And now we have a Defence Secretary with no interest in Her Majesty’s armed forces. Both supported Remain. And meanwhile the EU is busy plunging headlong into the development of its own common defence force structures and funding, with the UK signing up to everything. If you don’t want to donate to us for any reason, please donate to another organisation that is fighting like us on this subject. It’s critically important that Brexit organisations have the minimum means to keep the fight going, or we’ll end up in an EU no-man’s land which no-one will be able to distinguish from full EU membership. And we’ll have left our armed forces left behind on the battlefield. We welcome your comments, which we will publish below in the grey box below. You can use a pseudonym if you prefer, and it's always nice to know roughly where you're writing from. Please state the headline of the article you're commenting on. Message: It is INDEFENSIBLE we now have a 'pen-pusher' in charge of UK defences, and worse, a remain MP. Whilst I'm sure the Rt Hon Gavin Williamson CBE MP may have a genuine persona, I am concerned he will be influenced by the European Union commission to 'deliver' UK forces and military equipment to EU command? In my opinion, the top political appointments should be given over to MPs who believe in our great country, and in Brexit. When MPs enter The House of Commons, they are required to make an Oath or to affirm their loyalty. They do not swear an Oath to the EU in the UK Parliament. It is reasonable to suggest many elected MPs, and unelected peers, have broken their Oath of loyalty, as they chose to give away our country without consent. Lest MPs forget, we chose to take back sovereignty and regain our place on the world stage. Mr. Williamson would do well to remember that sovereignty is vested in the people, and the electorate only 'lend' MPs our votes. Message: The permanent secretary (top civil servant) on the left was top dog at DECC and transferred to defence. He has a degree in English and worked for Deutsche Bank in their PR dept. Ideal for reducing our overbearing defence capability and boosting integration with the communist High Representative commander of the EU armed forces. Who is the bloke on the right with all the ribbons? Reply from Facts4EU.Org: The man on the right in uniform is the Vice Chief of the Defence Staff, General Sir Gordon Messenger. The smiling faces above are those of Secretary of State for International Trade Rt Hon Dr Liam Fox MP, his New Zealander trade specialist Crawford Falconer, and the Department's Permanent Secretary Antonia Romeo. They were about to give evidence to a House of Commons Committee on Wednesday. We assume at that point they knew about the latest trade figures from the ONS. The Office for National Statistics (ONS) has released its latest figures for the import and export of services. Services constitute approximately 80% of the British economy. The release contains consistently good news for all who back Brexit. There are some very interesting and positive figures contained in the information provided by the ONS. Regrettably the ONS chose to put as pro-EU a spin as possible on the figures, as we will show in a future article. However the figures were so good that even they struggled to make Brexit look bad. Below we have produced some typical Brexit Facts4EU.Org charts which show the good news very dramatically and clearly. Note: These are a relatively new type of figures from the ONS. To its credit the organisation has recently been changing and improving some of the statistics they produce, because it became apparent during the Referendum campaign that a lot of useful information was not being collected. The data the ONS is using in this release excludes banking, travel and transport, and therefore represents approximately 55% of the value of all services exports, according to the organisation. We searched the BBC website in vain for a news story about the above. We’re sure they must have covered the good news, but we couldn’t find it. Perhaps if the news story from the ONS had shown the UK’s trade with the EU was soaring it would have been headline news on the BBC. Certainly there are some in our office who would have placed large bets on that. As it is, you had to come here to get a quick and reliable summary. We hope you found it useful and that some of you might be able to re-use the graphs (with attribution of course!) when you’re posting on the internet. 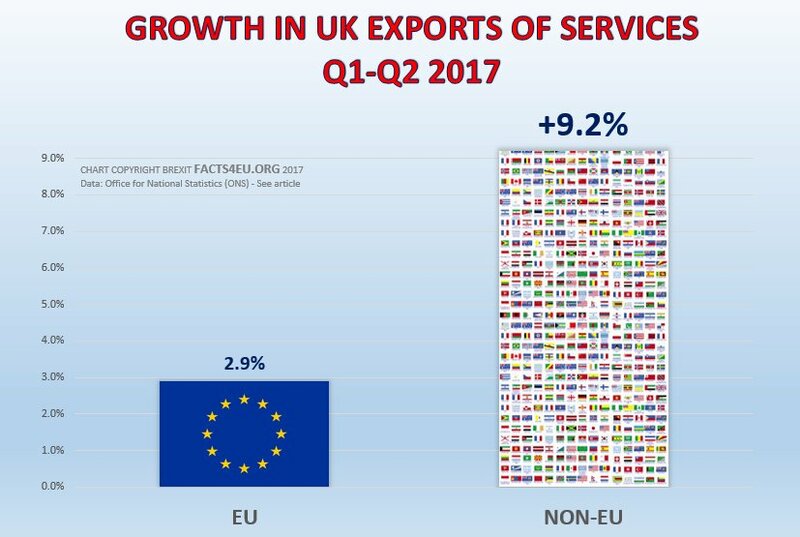 In essence, (and “despite Brexit”), the UK’s exports of services are growing and they are growing faster to non-EU countries. The EU continues to be of less and less importance. If you support Brexit like we do, we hope that puts you in a great Friday mood! Message: The surge in UK exports is indeed good news for the UK. 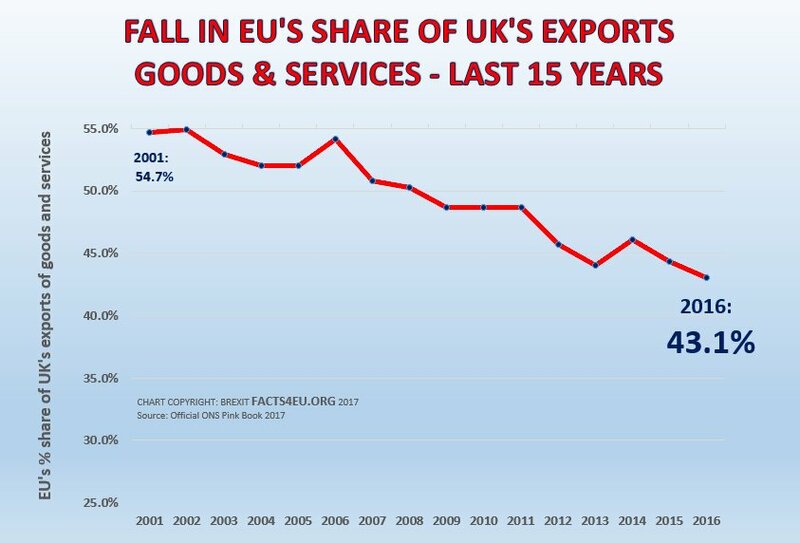 The facts provided here, supported by easy to understand charts, should be a wake-up call to the EU27, for this surge is in the main with countries we trade with using WTO terms. The European Union 'protectionist trade zone' should be asking themselves if they too would better prosper on WTO tariffs? When all said and done, for over forty years, the EEC/EU have tried to convince the gullible in the UK and across continental Europe how great and prosperous the European Union is. In fact, so good they say it is, we need only look at Greece, Italy, Spain and so on. Prosperous. I think not? Yesterday the Opposition tabled a debate to force the government to release the Brexit ‘Impact Assessments’ which the government has been conducting in relation to areas of the economy. Sir Keir Starmer, Labour’s Shadow Secretary for Exiting the European Union, proposed that these should be made public. The government (Robin Walker, Parliamentary Under-Secretary of State for Exiting the European Union) opposed the motion. You can watch the debate here or you can read it here. To listen to many Remainers, one would be forgiven for thinking that the entire process of Brexit was somehow being conducted in total secrecy away from all parliamentary scrutiny. The opposite is the case, as we will show. In just one day the number of person-hours spent in Westminster on Brexit was extraordinary. It involved countless MPs, Ministers, Lords, civil servants and specialist witnesses. It covered numerous areas of the impact of Brexit. Most of the investigating was run by MPs or Lords who voted Remain in the Referendum last year. One of the most bizarre, illogical, and hypocritical parts of the Remoaners’ opposition to Brexit is their sudden interest in detailed scrutiny of all things EU. Where were you for all those decades when EU laws and directives were being imposed on the British people, without Parliament being able to do a thing about any of them? For over 40 years the MPs and Lords in the Houses of Parliament became increasingly powerless in the face of the imposition of EU laws, directives, flag, anthem and customs onto the people they were supposed to be representing. Where were the expressions of outrage from them then? Where were the protests? Where were the motions in parliament, the demands for complete transparency, the insistence on dissecting and approving or rejecting new laws? Hypocrisy is never an attractive quality in someone. Remoaners would do well to remember that. Message: I challenge any members of the UK Houses of Parliament to read aloud the words in the "observations" box above, during questions or debates, VERBATIM? The words are concise, accurate, and could not possibly be challenged by remain MPs or peers? Maybe then, they will cease arguing and get on delivering Brexit? Message: May I add a further observation. I believe our elected (pro-EU) MPs, and (unelected pro-EU) peers, have to this day FAILED to explain to the British electorate WHY we were denied our democratic voice to EVERY EEC/EU Treaty imposed upon us, for which we pay a heavy price tag? It is no surprise that we have little faith in our elected MPs to aim for a 'clean Brexit'. Perhaps Sir Kier Starmer MP (Shadow Brexit Secretary), and others, should be answering this legitimate and most fundamental of all questions at the Despatch Box on the floor of the House of Commons? Message: The people who want to stay in the EU are desperate to derail the Article 50 process of the UK leaving. Hence Clegg, Clarke and Adonis trip to see Barnier who told them that we the UK can change our minds and stay. They are all colluding to keep the UK in this undemocratic socialist hell, that is leavers' view of our future. We voted to leave against their wishes, instructions, and threats. This is the EU's and remainers' last throw of the dice, with the process under way we automatically drop out the EU on 29th March 2019. With or without a deal, the sun will still rise on 30th March 2019, life will go on, but most importantly we the British people will once more be able to live in a sovereign, free democratic country. Yesterday a very fine man, Sir William Cash MP, was re-elected as Chairman of the European Scrutiny Committee. Some young bucks sometimes poke fun at Sir William for his more roundabout style of speaking, which can require a little patience from his audience. To some he can also seem far too decent and not aggressive enough in the face of a Remainer-majority government. However this is a man who has been fighting the Brexit battle since before most Remoaners were even born. In fact he’s been fighting for his country since before many of their parents were even born. We are very happy to ‘splash the Cash’ and we hope you will put aside all party politics and join us in raising a toast to celebrate the re-election of The Grand Old Man of Brexit, Sir William Cash MP. There’s a very strong argument for free trade. So strong is it, economists we read will tell you that the world doesn’t even need free trade deals. They argue that free trade is the answer without even doing special deals - in other words we should trade without tariffs even if no particular deal is possible. The economists we read were amongst the few not to advocate the disasters of the ERM, the Euro, or EU membership. That said, in this article and the one that follows let’s talk free trade deals, because so many people are telling you that the UK mustn’t leave the EU without one. HOW MANY EU TRADE DEALS ARE THERE? When we first started looking at EU free trade agreements (FTAs) the EU had a list of just six. One effect of the EU Referendum campaign coming along was that the spotlight got turned on the EU’s activities in a revealing manner. This led to their PR machine suddenly going into overdrive. Before we knew it, the list of the EU’s FTAs had exploded in number, although it became increasingly difficult to know what they were classifying as an FTA. A figure of “50 FTAs” started being bandied about. By 2017 the language had become so vague that countries with whom the EU has no deal and with whom the EU is not even negotiating, were included on the list of “Trade Agreements Being Negotiated”. On this list today are countries like the Philippines, Thailand, and the United States. No negotiations are scheduled with any of these countries. There are also countries like Kuwait on the list where talks were suspended long ago and none are planned. The last time the EU talked trade deals with Kuwait, Gordon Brown was Prime Minister and Boris had become Mayor of London for the first time. The EU’s nomenclature in regard to trade has passed into the world of the ridiculous. The trade deal with Canada (CETA) is still awaiting ratification. So is it on the list of countries “Awaiting Signature or Ratification”? Er... no. It’s on the main list – the list of 70 countries with whom the EU ostensibly has a deal. Even when CETA does finally get ratified (assuming it ever does) it will no doubt continue to be described as having taken seven years to negotiate. In fact, talks started in Ottawa in 2004. That’s 13 years by our simple maths. We researched and wrote this as another example of just how ridiculous the EU really is. We see it, day in, day out, as we research the stories we bring you. Naturally all governments have their idiosyncrasies and foibles. However not all governments have been engaged in a systematic dissemination of propaganda and brainwashing for many decades and are unelected. It’s unfortunate that Remainers are constantly repeating statements about the EU in relation to trade, without having the faintest idea what they’re talking about. When these Remainers are ordinary people, that’s understandable and forgiveable. When the Remainers spouting complete and utter nonsense about the EU in relation to trade are MPs, MEPs, think-tankers, civil servants and senior journalists then it is is neither understandable nor forgiveable. Message: "Trading the Truth". Yet more works of excellence from the Facts4eu team whose only desire is to inform and expose reality in great detail, something we rarely hear from our elected MPs on the floor of The House of Commons - with exception to those champions of Brexit? The EU elites behave like a 'secret' organisation (in my opinion), and it's only by getting REAL facts into the real world can we challenge our elected [remain] MPs who often forget they work for the UK population, and NOT the EU commission. The Facts4eu team deserve a special mention for bringing us facts, unlike the propaganda we still hear from elsewhere day after day. I would like to take this opportunity, and believe I can speak for all readers and supporters here, to say, THANK YOU. Facts4EU.Org team: You're very kind. Message: In general the value of further trade liberalisation is being routinely and grossly exaggerated. That is not to say that a fraction of a percent added to GDP is not worth having, even if that overall gain is spread over a number of years during each of which GDP is increasing anyway by natural growth. But it should be understood that most new trade deals are now only marginally beneficial, politicians may talk up the projected benefits but when you look at the numbers they are small. Likewise the overall benefits of the EU Single Market are always being vastly exaggerated, the truth is that for the UK it has probably added about 1% to GDP while averaged across the whole of the EU the gain has been about 2% added to GDP. Any losses from leaving the Single Market will be slight, but similarly any gains from new trade deals around the world are likely to be slight; offset one with the other and whether the overall change is positive or negative it will be marginal. Message: Facts 4EU in this article and the one below you have done it again... really probed for the FACTS and shared your excellent research. Unlike the PR Spin garbage we, the Public, are subjected to daily from those who we ought to be able to trust. But, for now, we cannot as Pandora's Box has now been prized opened and all kinds of 'nasties' are crawling out. Shall we call them 'lies' rather than 'nasties'? Whatever, this is an abhorrence to all who seek the truth and value Democracy: history tells us honest debate is the only way for a Civilised Society to work. PR Spin Doctors are actually paid to turn bad news into good and twist the truth whether it be advising Politicians, Industrialists or the Civil Service. It's now had its day. It's an outdated industry. And when we have severed links with the unelected, dictatorial, EU Bureaucrats maybe, just maybe, our own politicians will start thinking once again for themselves and have the humility to actually listen to their constituents. For too many years they've had an easy time of it, swallowing what they're told by the EU, or a twisted Civil Service, whilst sitting back and enjoying the perks. That will not do for us, the British Public. No longer can anyone fob us off with untruths, or misinformation. On the plus side, the honest, intelligent Public Servants will come to the fore; they will share their own investigative findings, just as Brexit Facts 4EU do here, to debates that then become valid and worth discussing. How exhilarating that will be! Message: I support Brexit Plus, not least because we need to carve out an independent and coherent role for ourselves on the world stage, with as few ties as possible to the EU other than those which are to our benefit, before the EU disintegrates. It has morphed inexorably from a trading group into an empire, not, yet, tyrannous, but sclerotic, corrupt, remote and incompetent. And like all empires, decay starts at the edges. The western fringe is seceding; the eastern fringe is in open revolt; crushed and humiliated Greece simmers resentfully. We have a strong hand to play, unfortunately vitiated by the treachery of high-placed remainers. We need urgently to thwart them and rejoin the world, free of the chains of the EU. 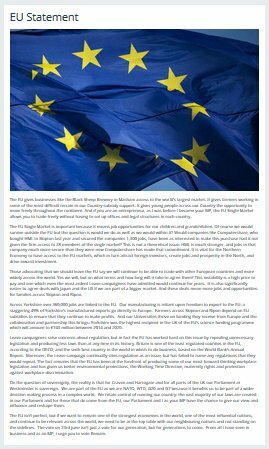 Facts4EU.Org team: Anna mentions Brexit Plus which we last wrote about last month. Readers might want to read about our two positive pieces on Brexit Plus starting here. Countries usually want free trade deals in order to expand their trade. They don’t normally spend years sitting around negotiating, just to end up with something which is no better than where they started. Remainers constantly talk about the necessity of a trade deal with the EU. Following an EU Parliament report on trade deals last week, we thought we would take a closer look at how valuable they really are. We picked one at random. The EU’s deal with CARIFORUM was signed in October 2008 – nine years ago. There are fifteen CARIFORUM countries (CARICOM plus the Dominican Republic) and seventeen territories in the Caribbean with direct links to EU countries. Four are French 'outermost regions' and thirteen are 'overseas territories' - six British, six Dutch and one French. This deal is what the EU calls an “EU Economic Partnership Agreement”. The EU likes expressions with words like ‘Partnership’ in the title. So, 9 years after it was signed, the agreement had only been ratified by ‘around half’ the Caribbean countries and by ‘around half’ of the 28 EU member states. We then looked at the trade figures for the last 10 years, based on EU Commission data for the EU trade and IMF data for the non-EU, Rest of the World trade. Below we show the amount of Caribbean trade each year for the last ten years ending Dec 2016. The deal with the EU was signed nine years ago, in October 2008. Unfortunately the graph shows a very sorry story for the EU, although less so for the Caribbean countries. The overall trade between the Caribbean countries and the EU fell in the last 10 years by 2.7%. This is despite the long-negotiated trade deal with the EU which was signed in October 2008. Conversely, the Caribbean’s trade with the Rest of the (non-EU) World saw a significant jump, rising by an astonishing 47.3%. An enormous amount is said and written every day about a trade deal between the UK and the EU after Brexit. Regular readers know that we have always been highly sceptical about this happening from the very beginning and in any case we never saw it as a necessity. We have written many articles about the EU’s inability to negotiate trade deals in a timely fashion. Frankly for decades the EU had little interest in them. They preferred to focus on achieving an ever-encroaching expansion of the EU into every facet of the lives of the EU’s citizens. Trade has only shot up their ‘visible’ agenda in the last two years because of Brexit. Suddenly voters became interested in what people like us were producing – charts showing how the EU had done precious little to promote trade and growth and had failed to do deals with any major economies around the world. As voters were shocked by the EU’s lack of success on the international trade front, so the EU quickly started new initiatives and also began to started pretend that progress was a lot further along than it really was. 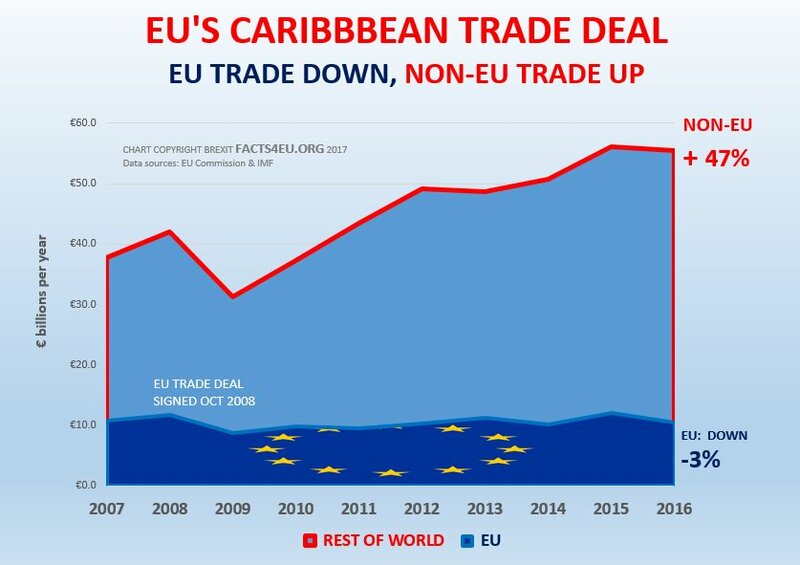 We think the above case of the EU’s deal with CARIFORUM shows another interesting angle to the whole trade debate. Here is a trade agreement – an “EU Economic Partnership Agreement” no less – which has produced no growth in trade in the nine years since it was signed. In fact overall trade has fallen over 10 years, by 2.7%. Not only that, but our chart shows that the Caribbean region has grown its trade by 47.3% with the rest of the world in the same period. This makes a mockery of the EU’s trade deal. If the UK exits the EU at midnight on 29 March 2019 without a bespoke trade deal and under normal WTO arrangements, we continue to believe that life will be just fine. And unlike most Remainers, our belief is based on a great deal of research over a considerable period of time. If you value having real facts to support your instincts, maybe you could help us? To read our output from 16 - 31 Oct, simply click here.